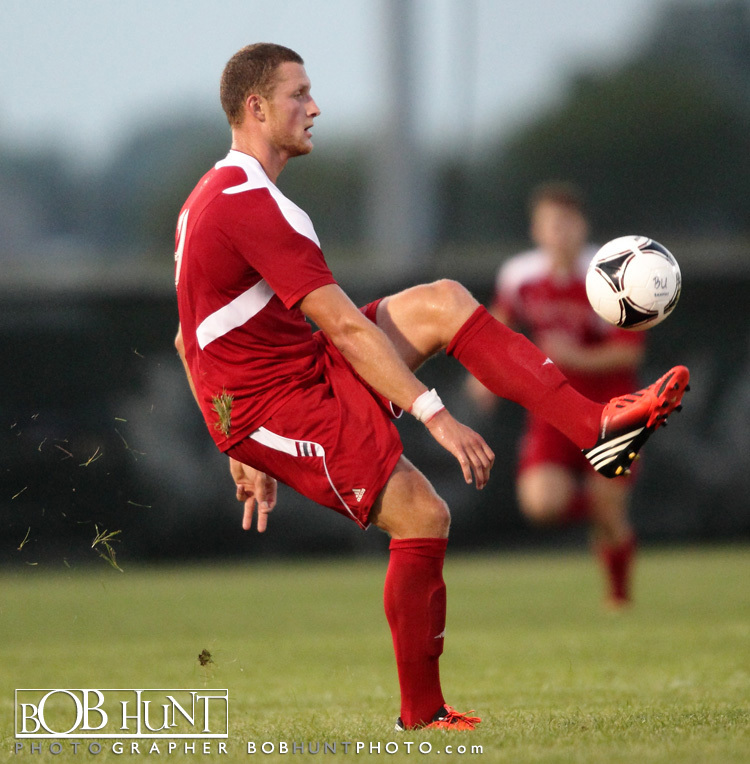 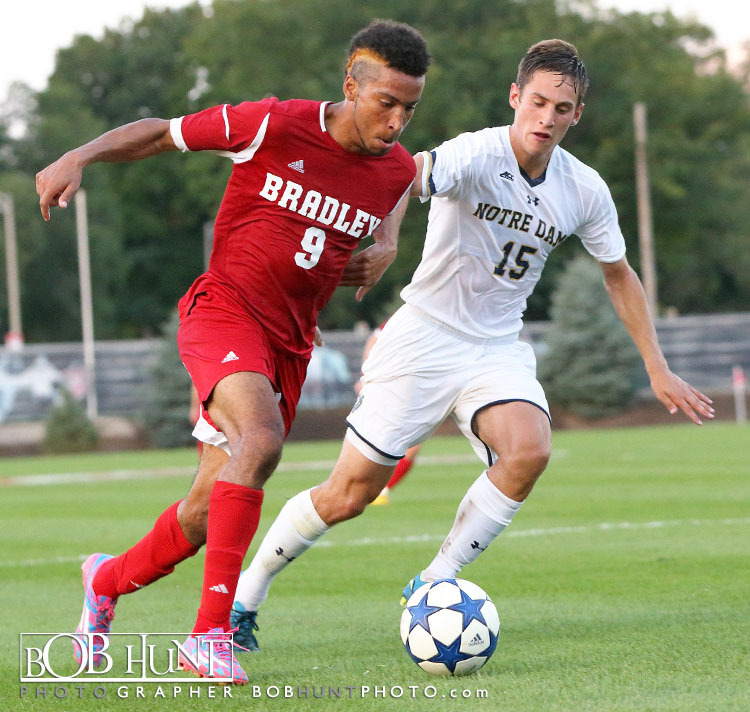 Dayton defeated #25 ranked Bradley University at McClallen Park on Morton Community night, as the veteran Flyers used a pair of goals midway through the second half to pull away for a 3-1 exhibition road win. 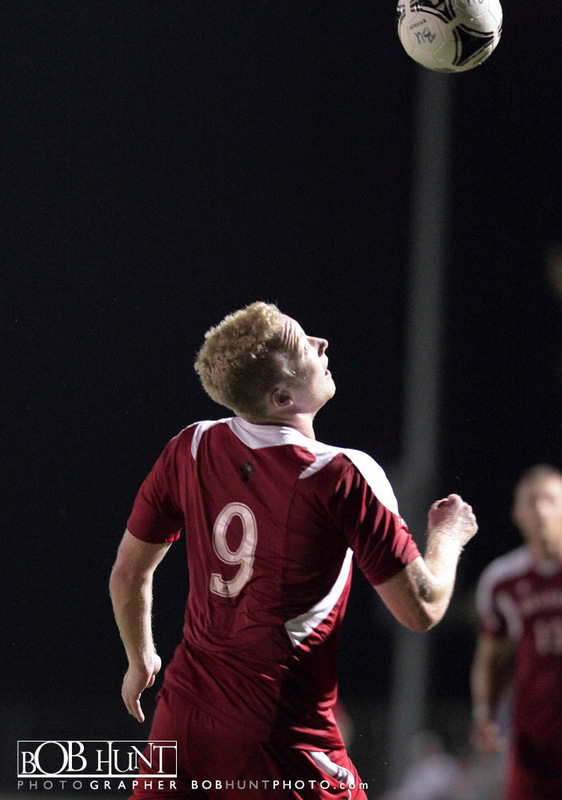 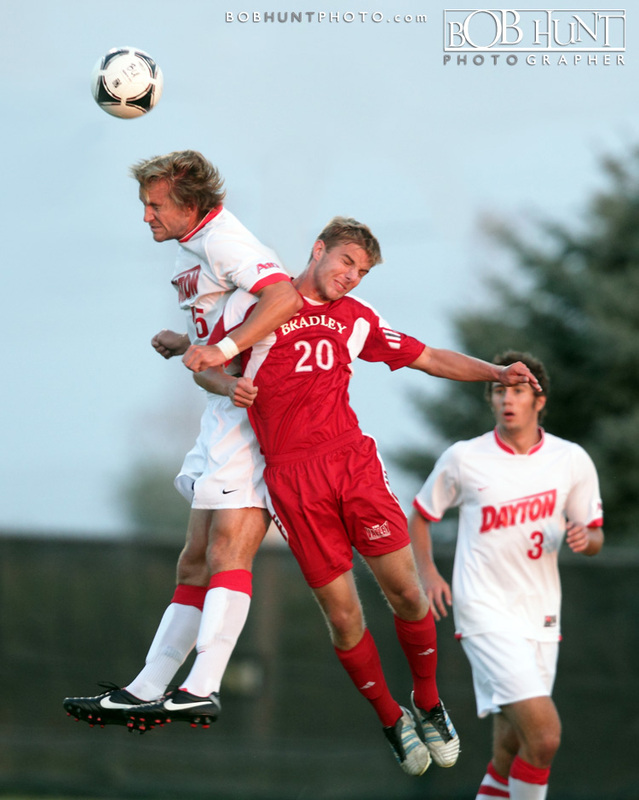 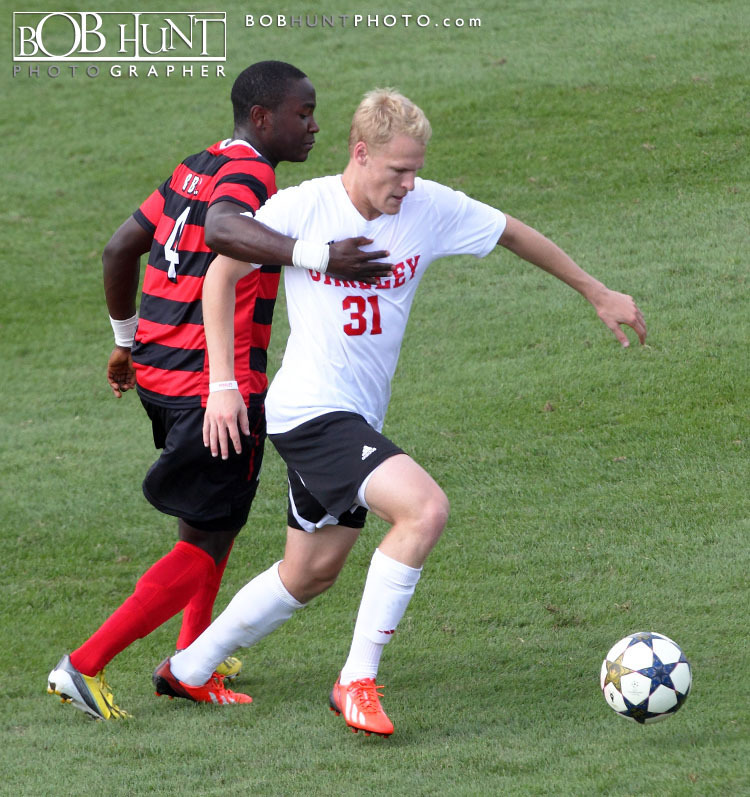 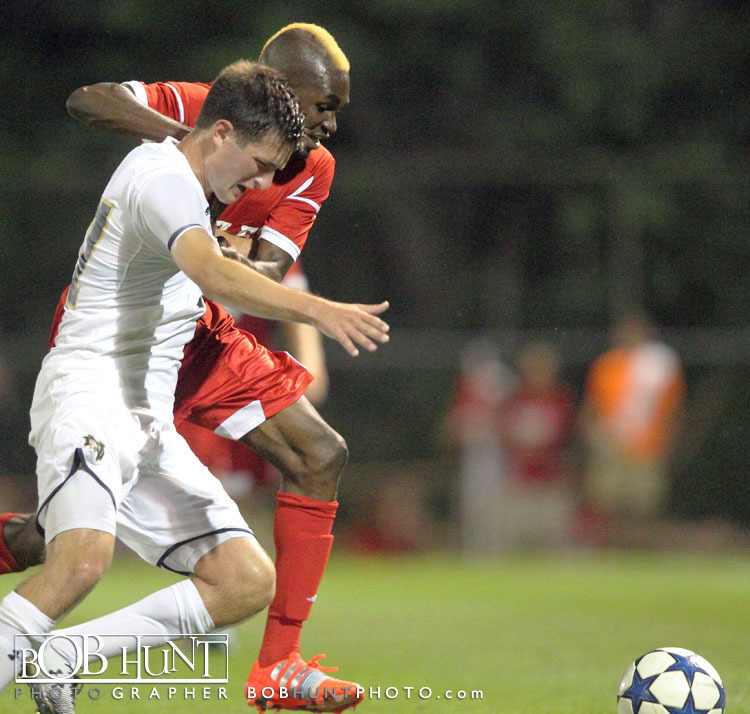 Evan McCreary scored the game’s first goal in the 17th minute, then tacked on the capper in the 67th minute to lead the Dayton effort. 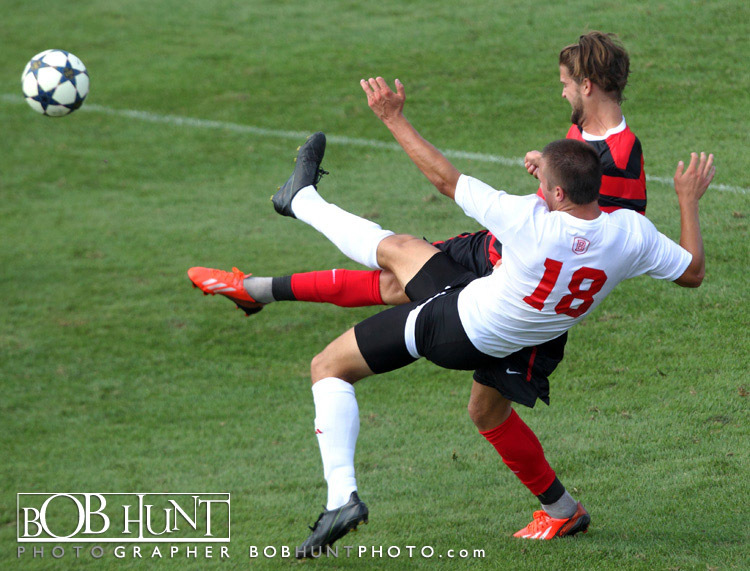 Greg Enstone earned the game-winning tally by finishing off his run through the box to push Dayton ahead, 2-1, in the 59th minute. 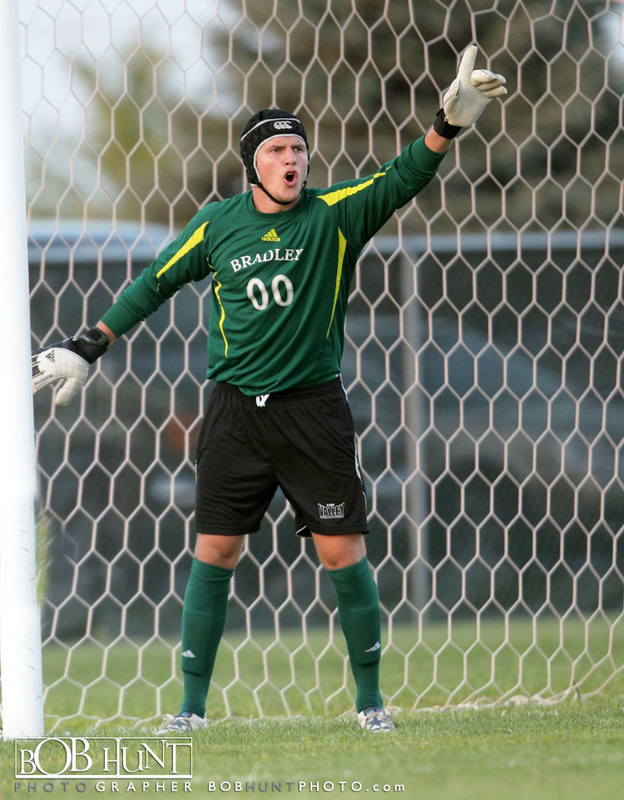 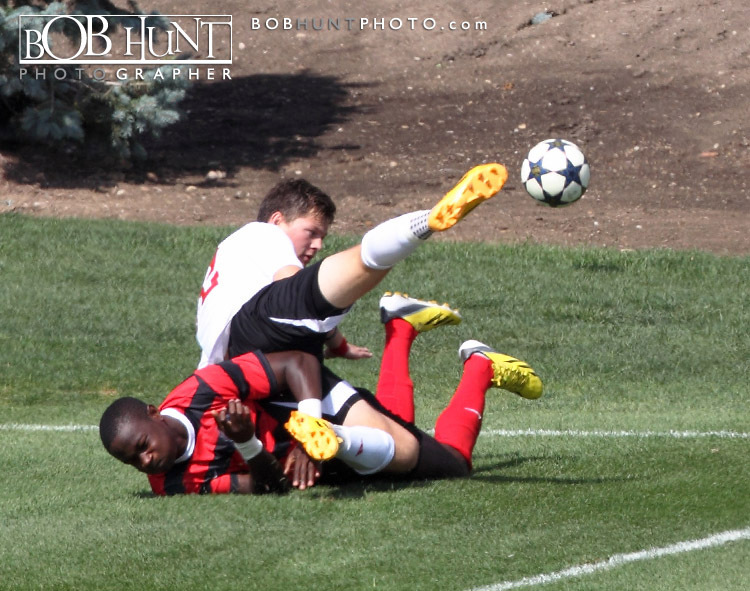 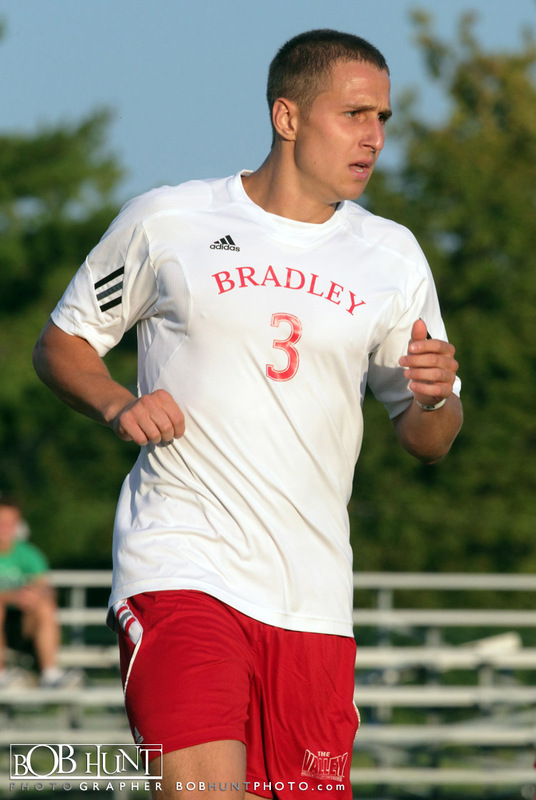 The Braves bounced back from McCreary’s first goal by netting the equalizer just 59 seconds later when Wojciech Wojcik scored in traffic off a feed from Tapiwa Machingauta in the 18th minute. 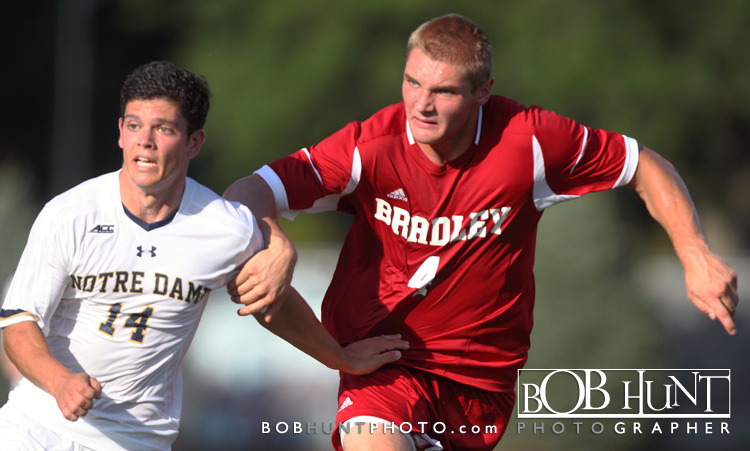 The Flyers finished the night with a 14-12 advantage in shots and limited the Braves to just three shots on goal. 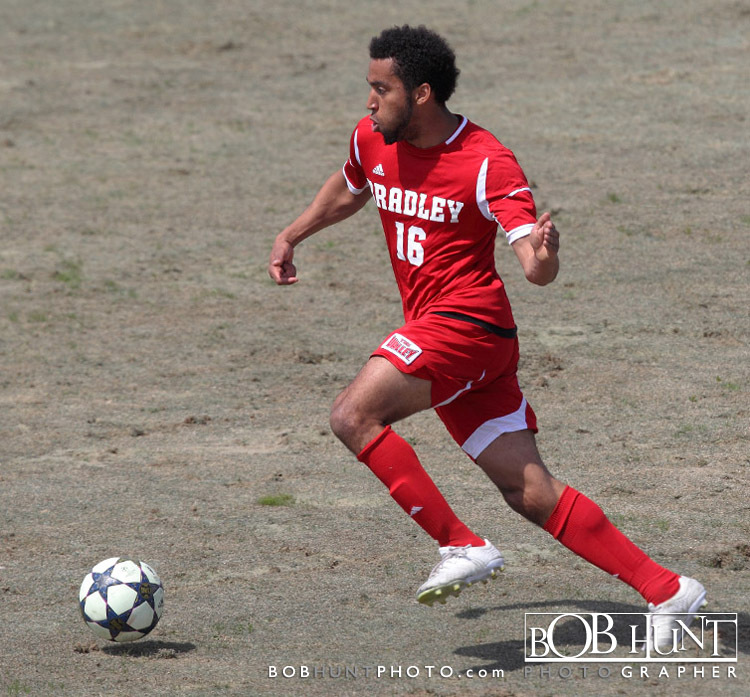 Click here to view photo’s to purchase. 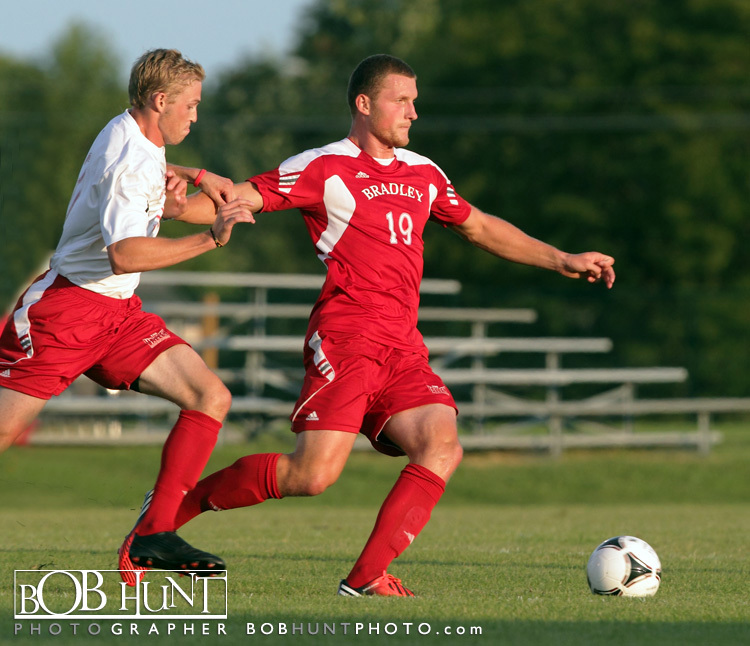 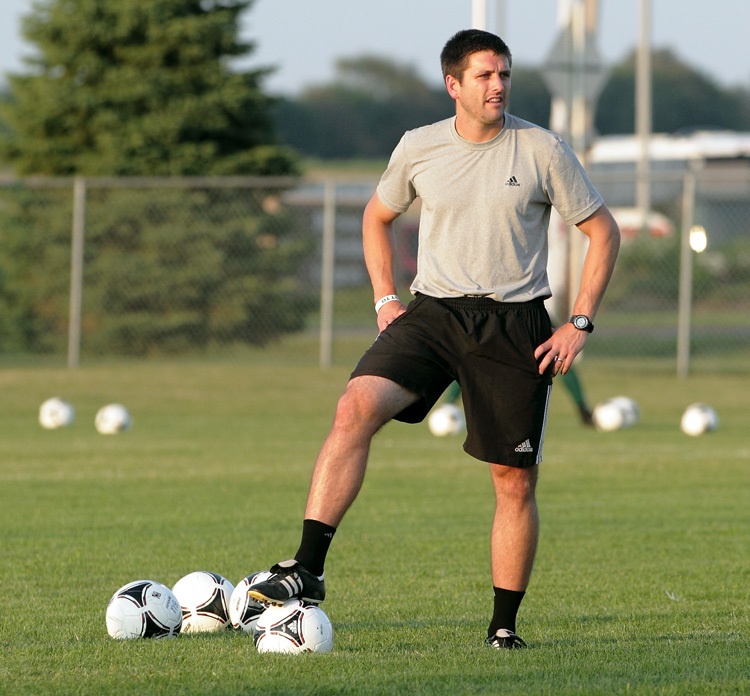 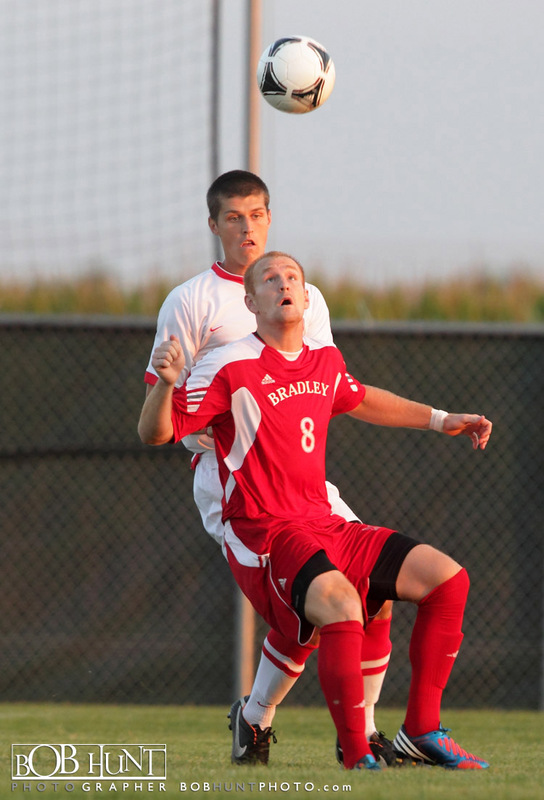 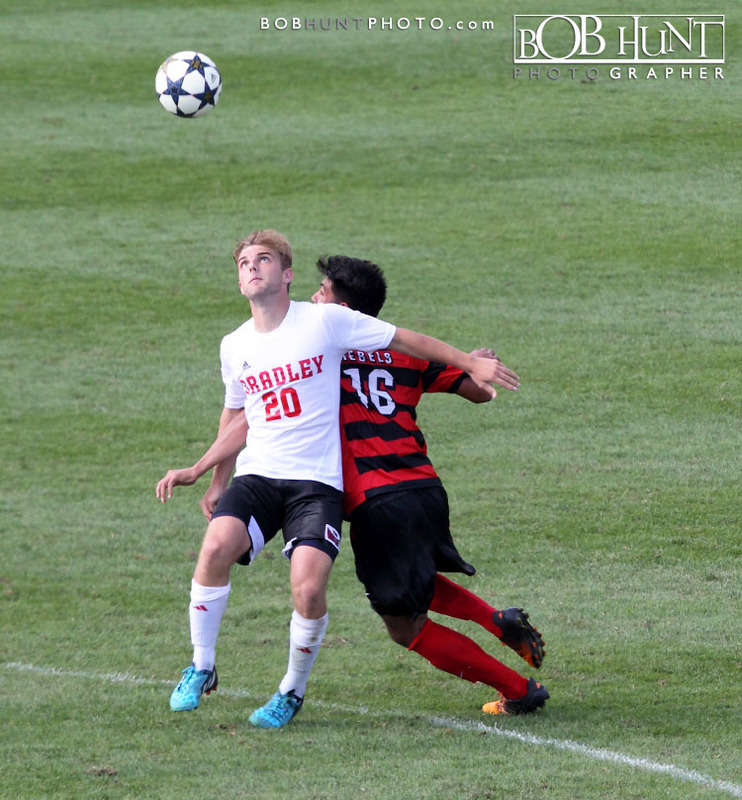 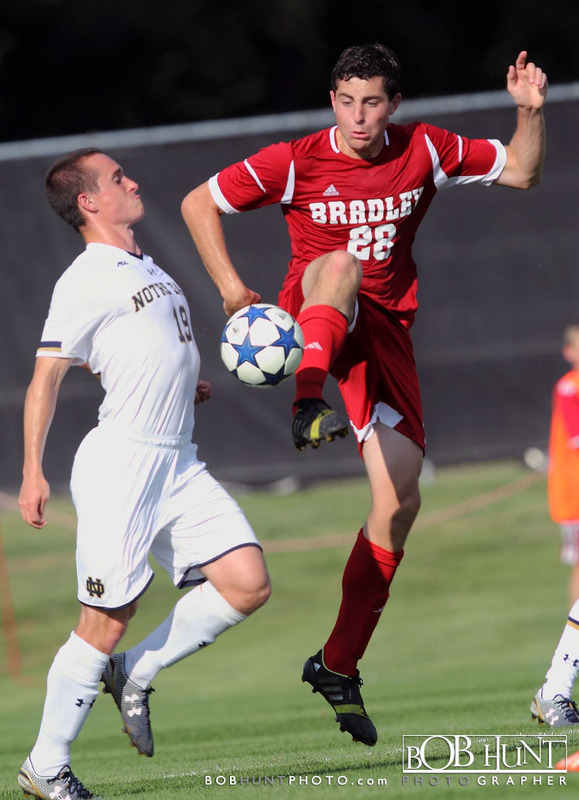 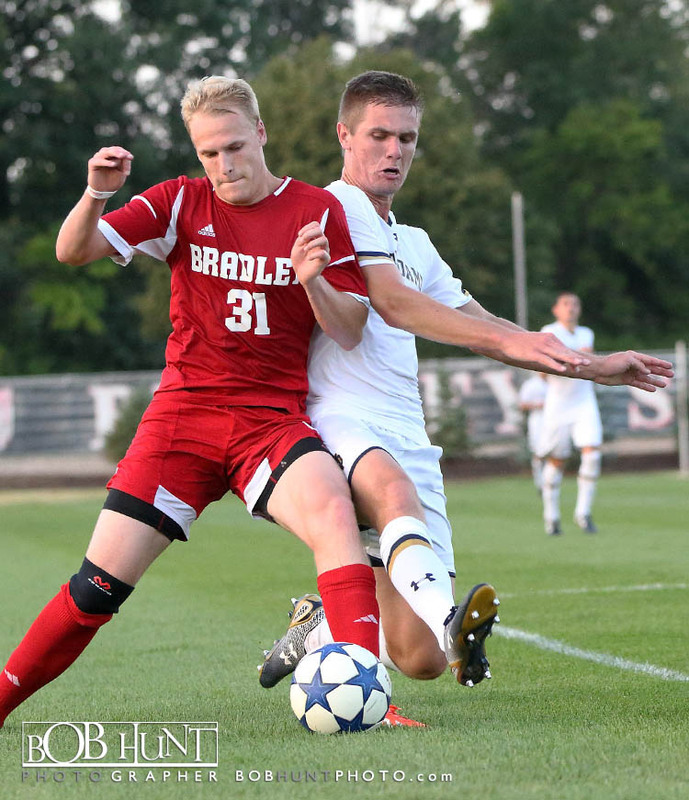 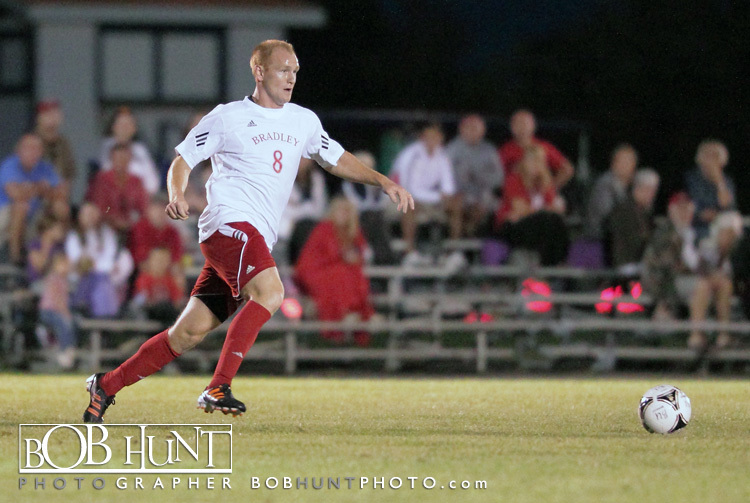 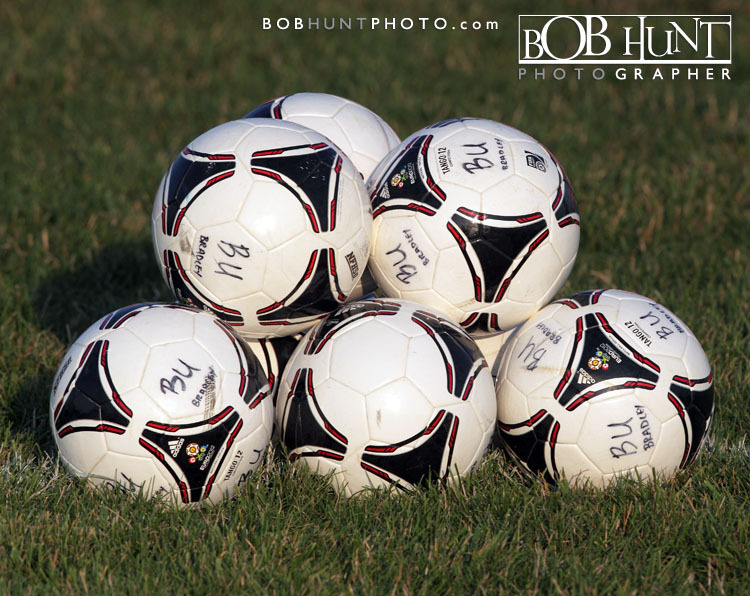 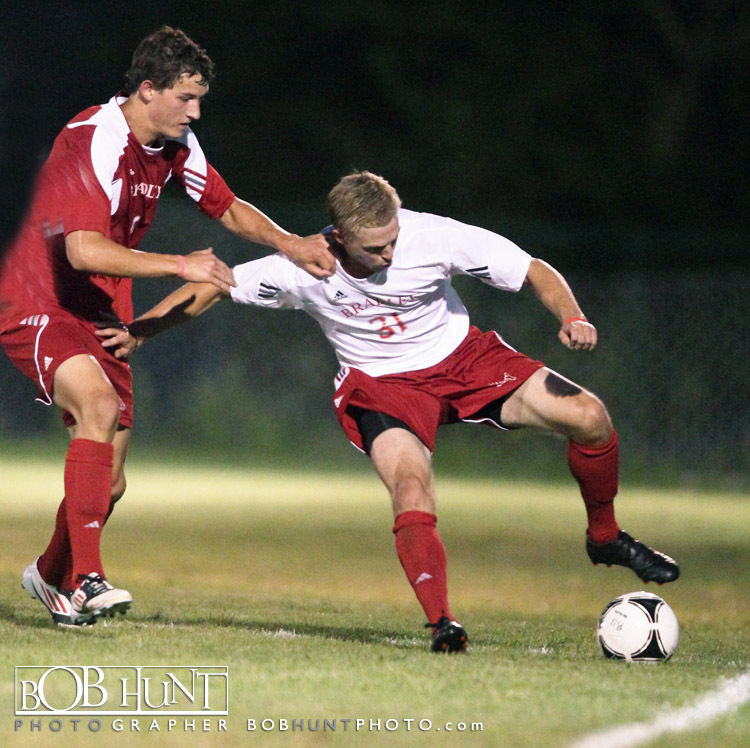 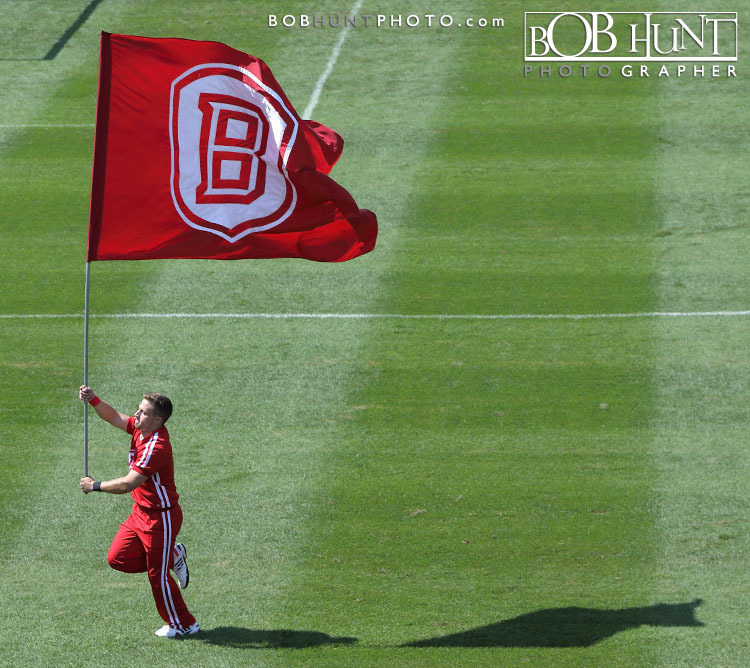 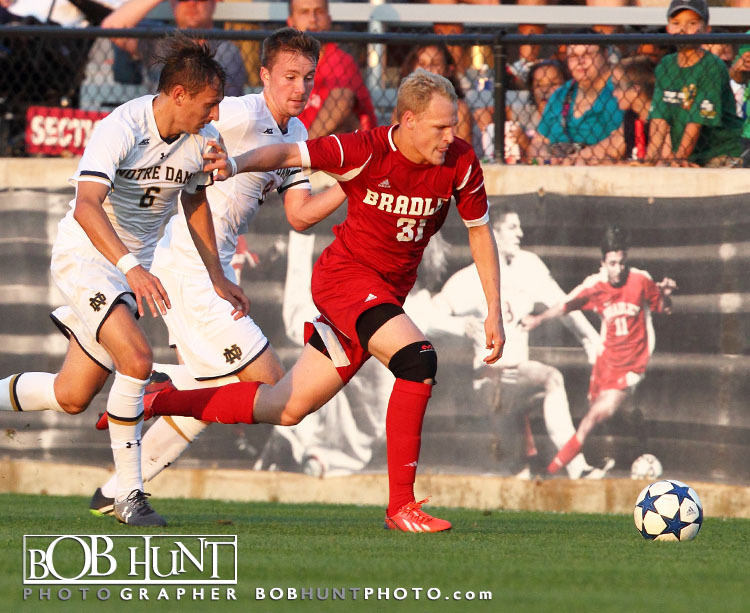 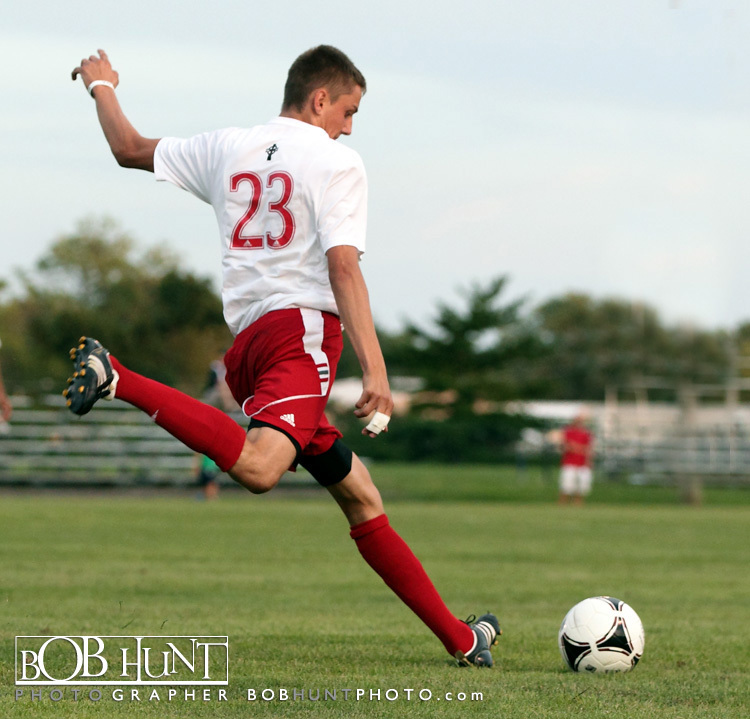 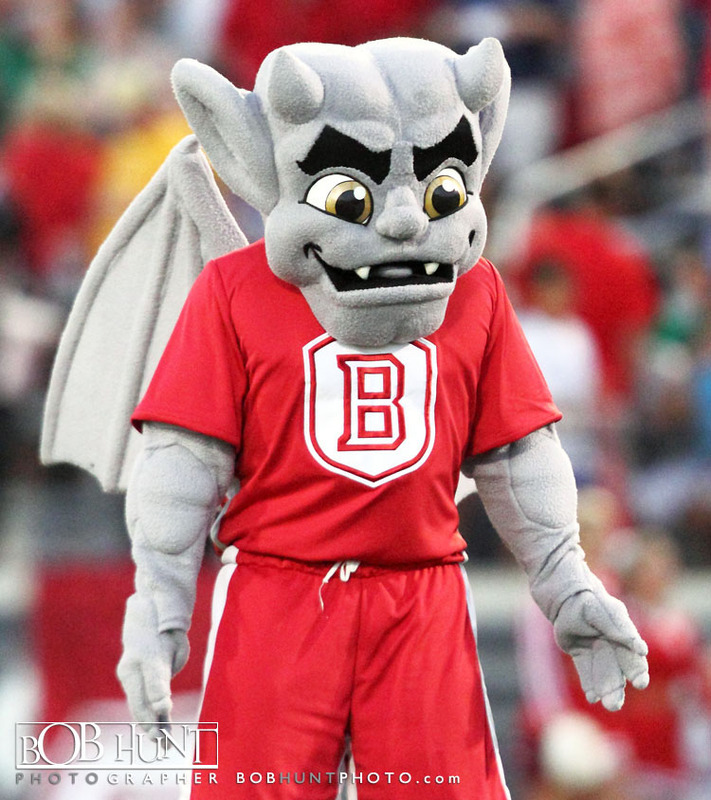 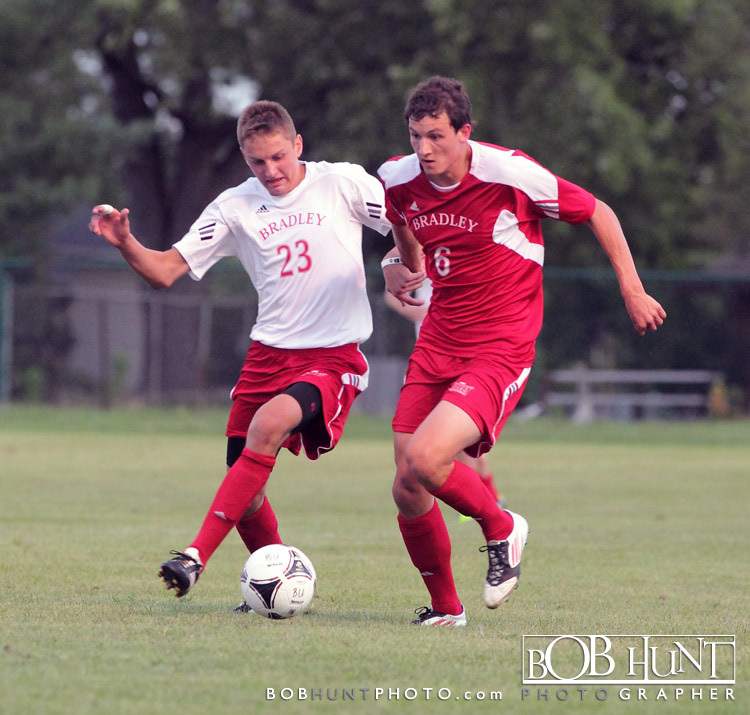 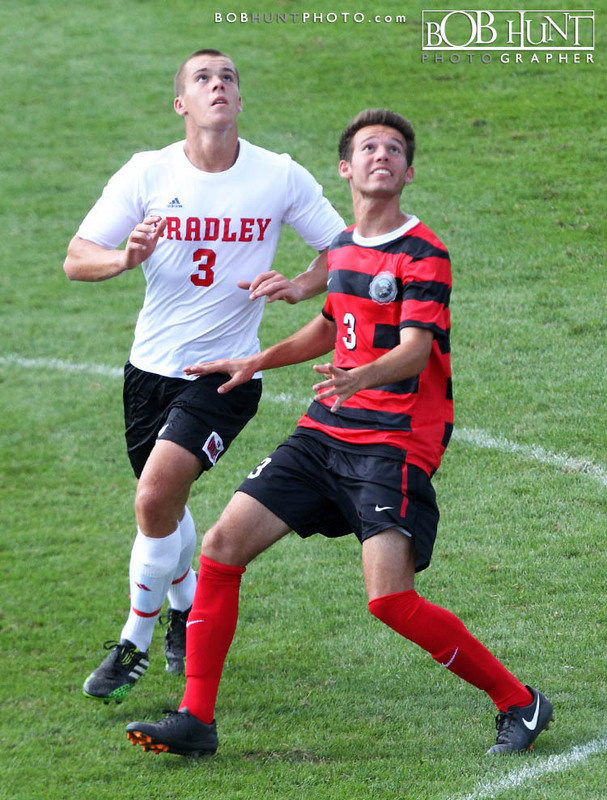 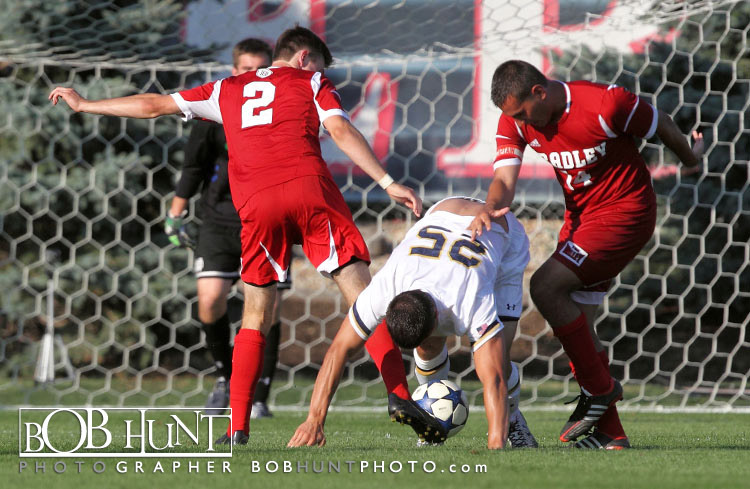 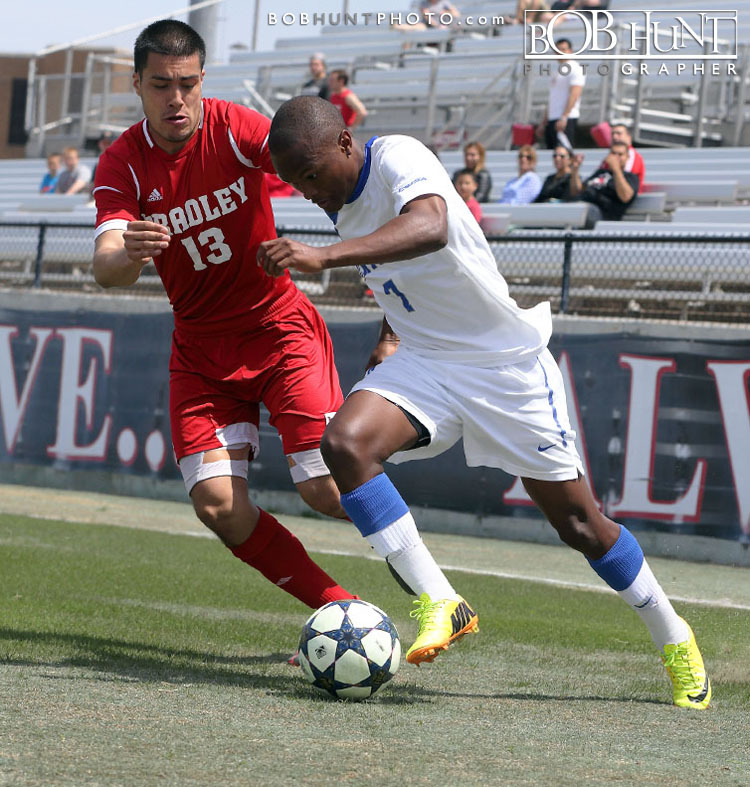 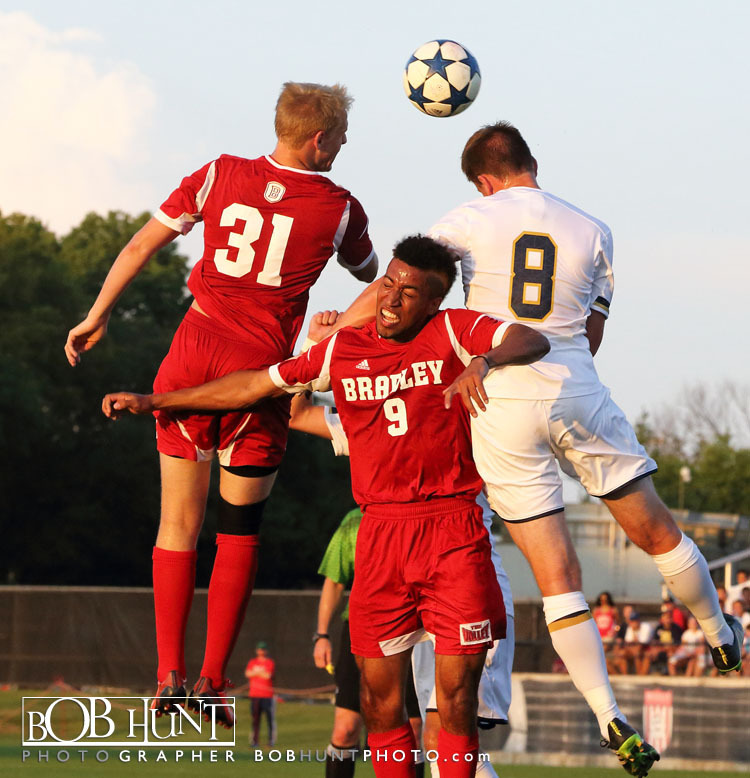 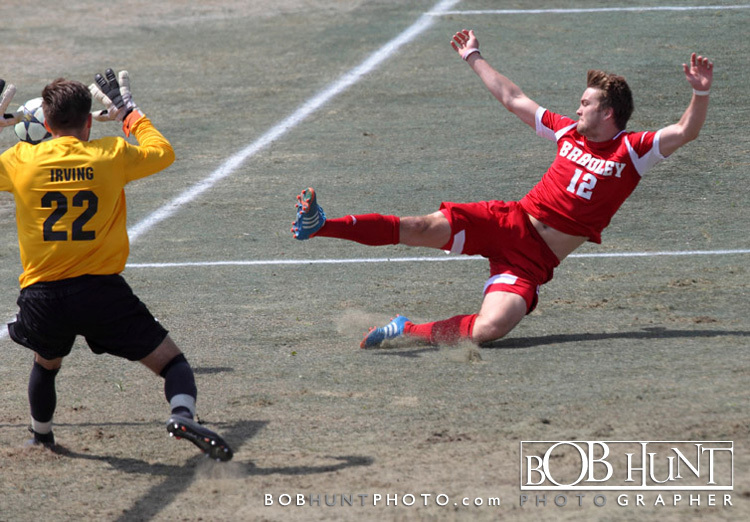 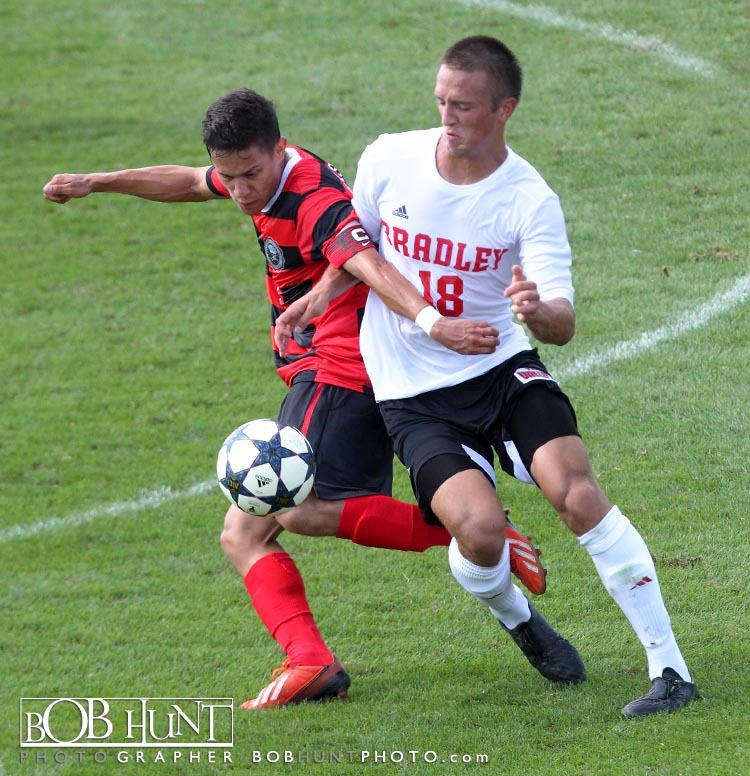 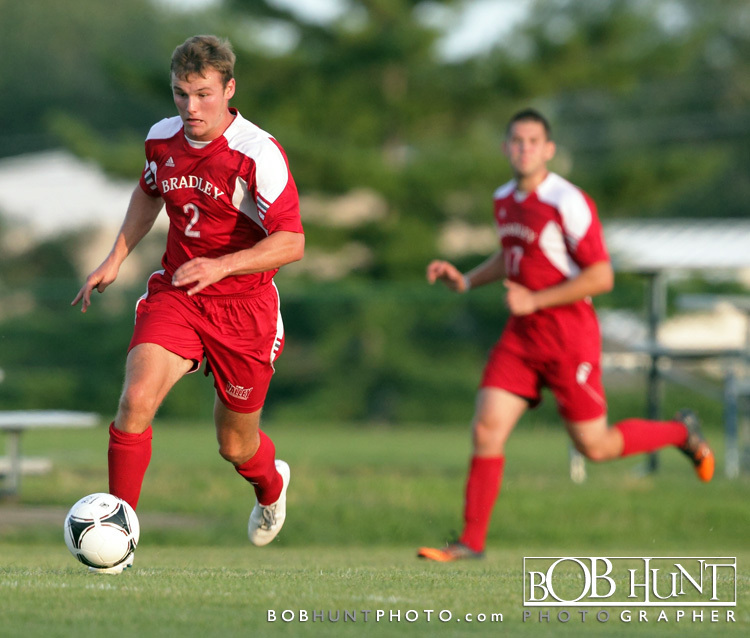 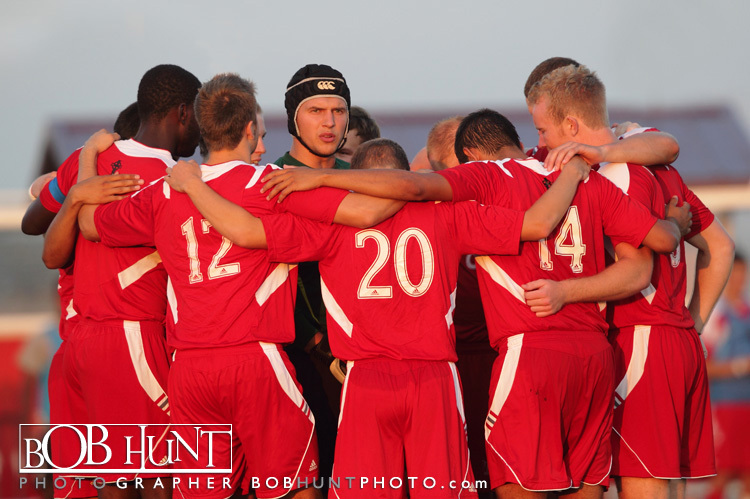 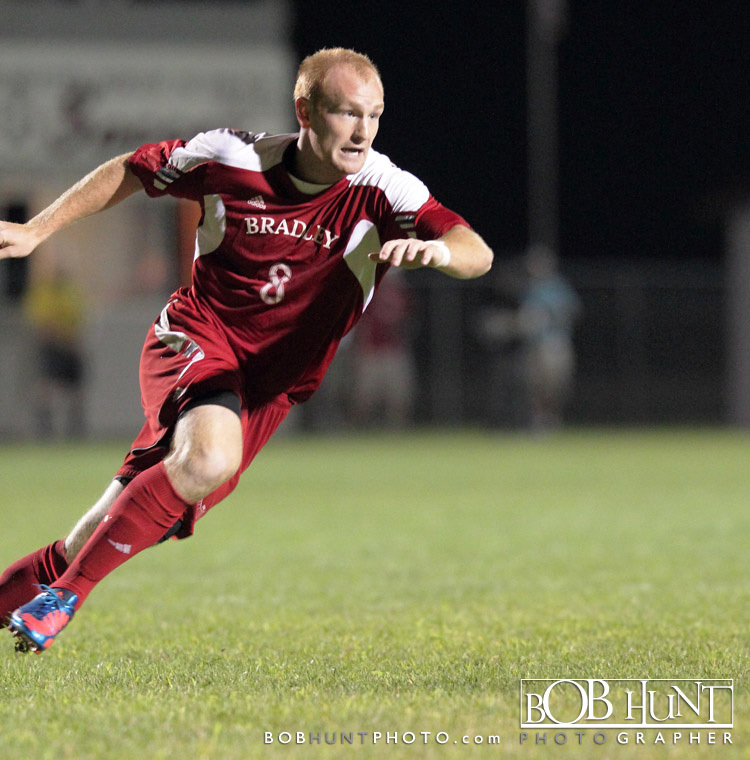 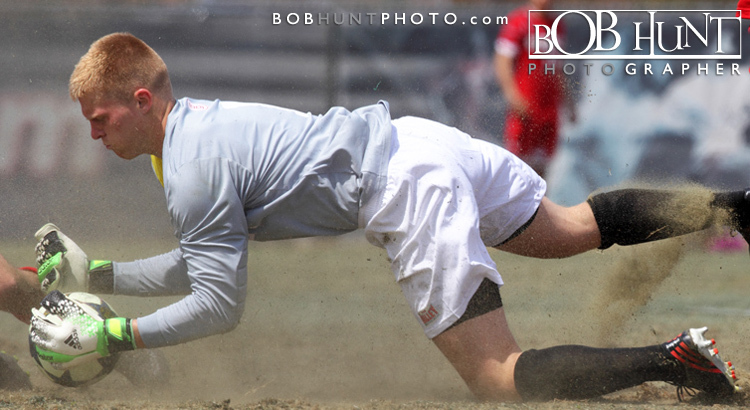 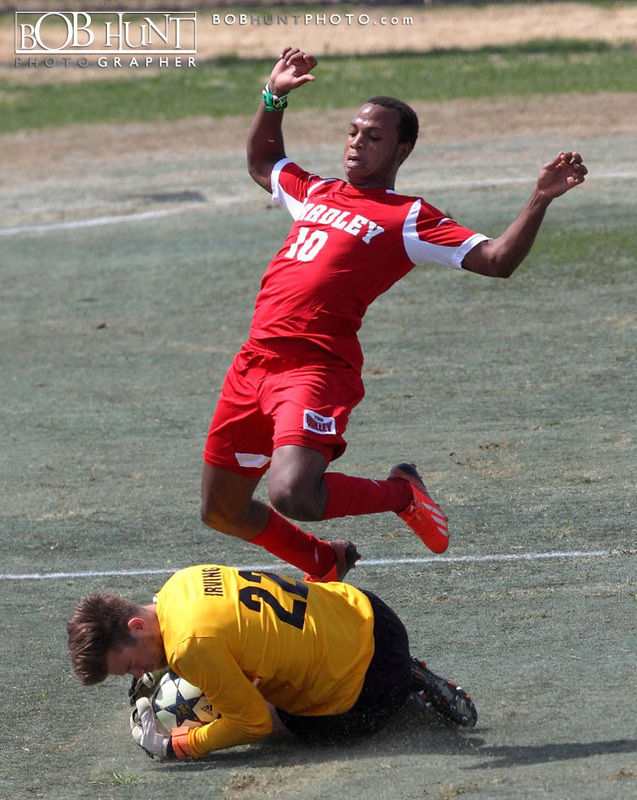 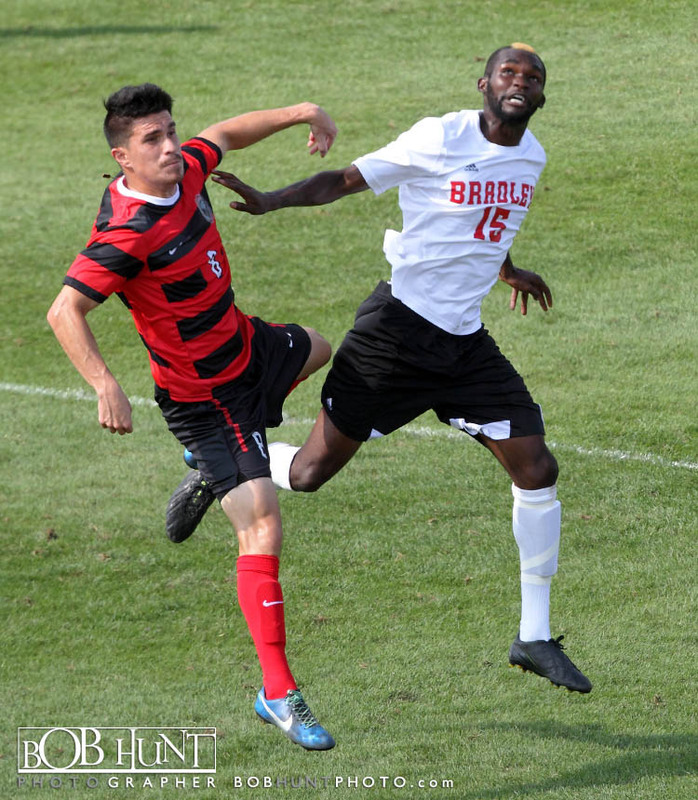 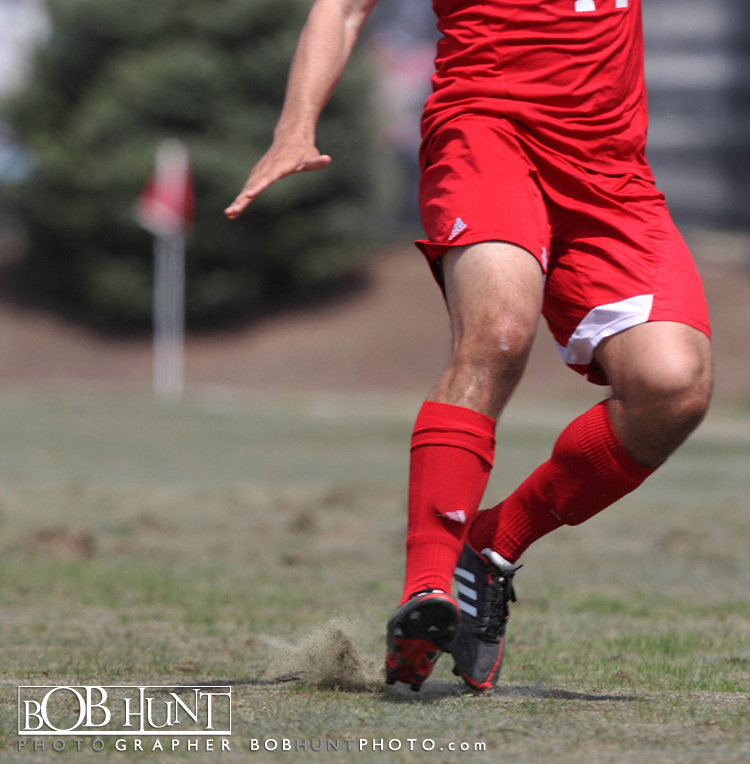 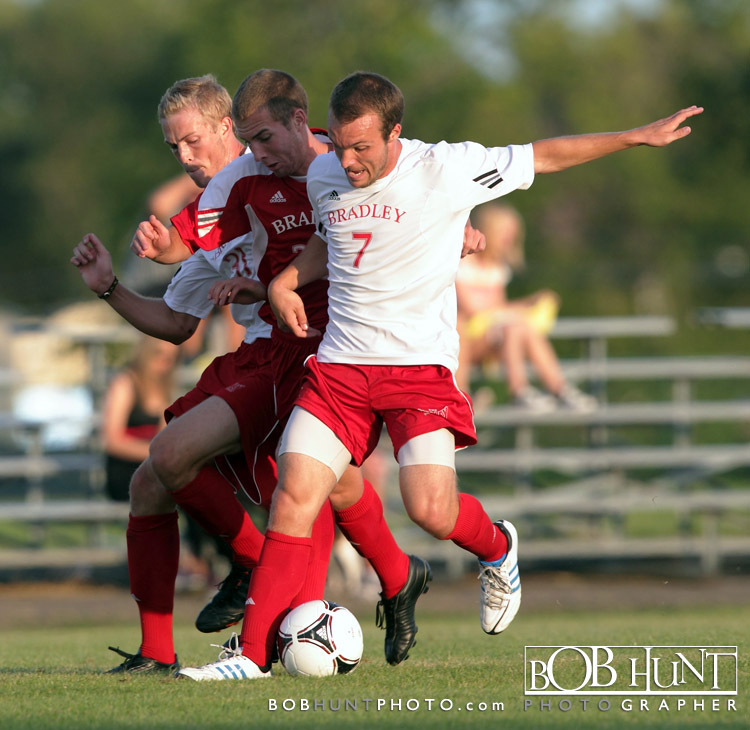 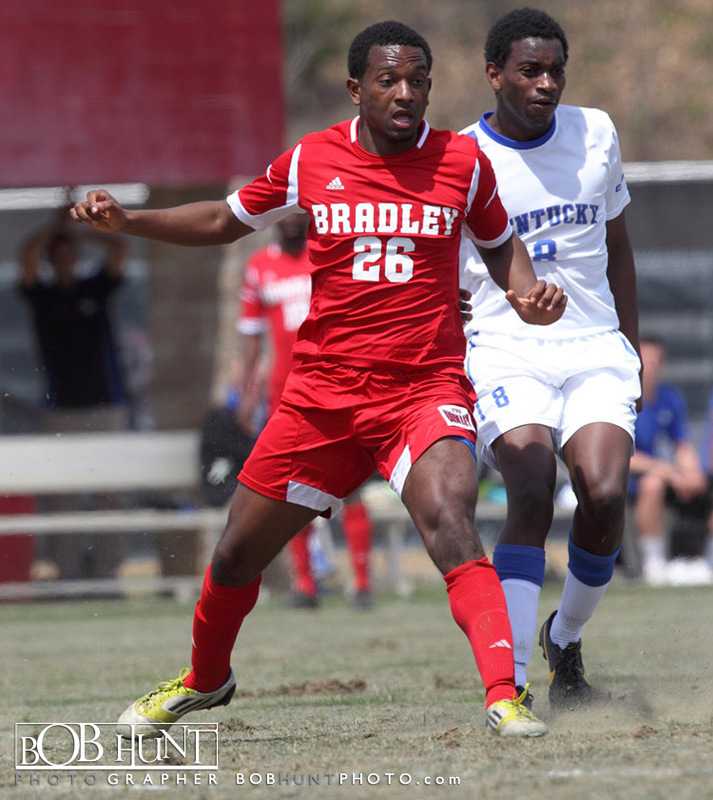 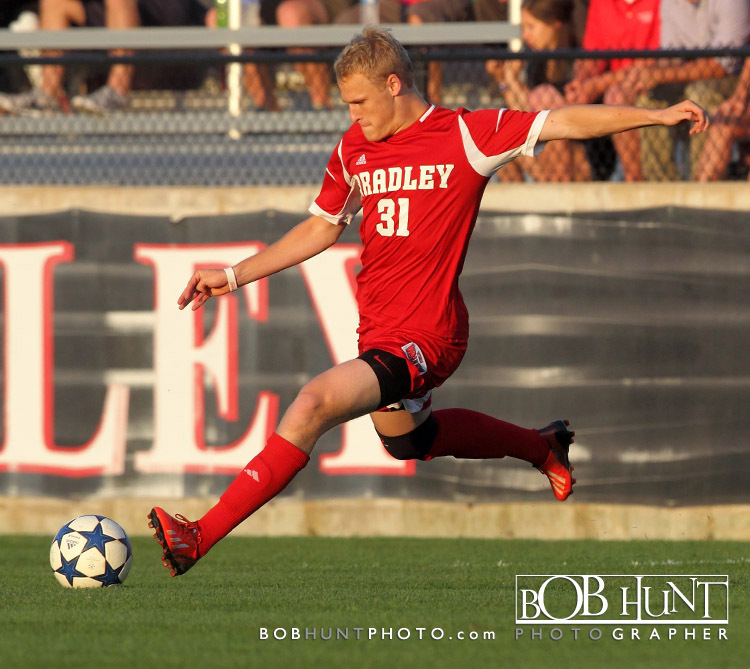 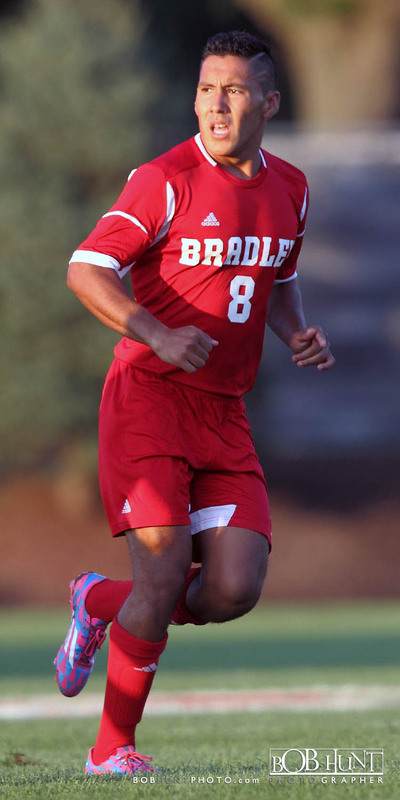 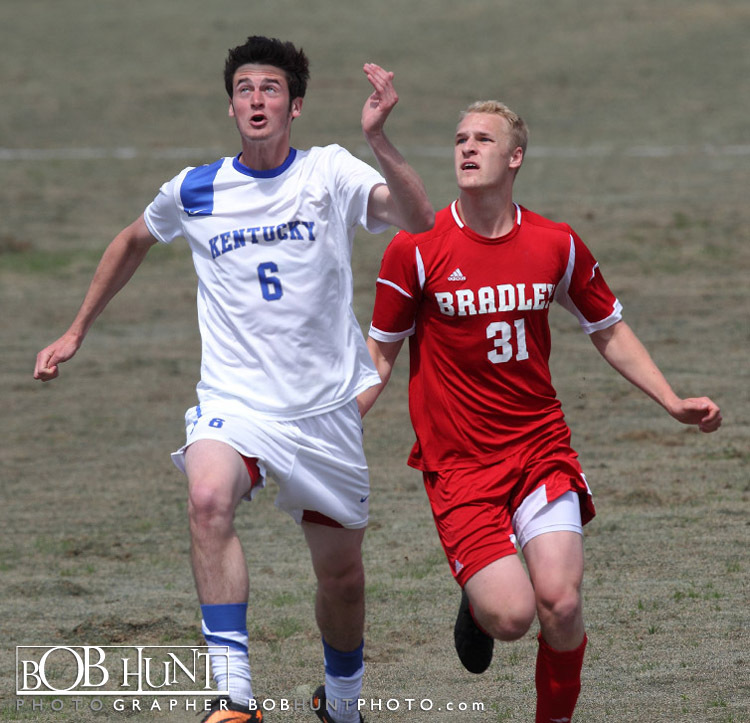 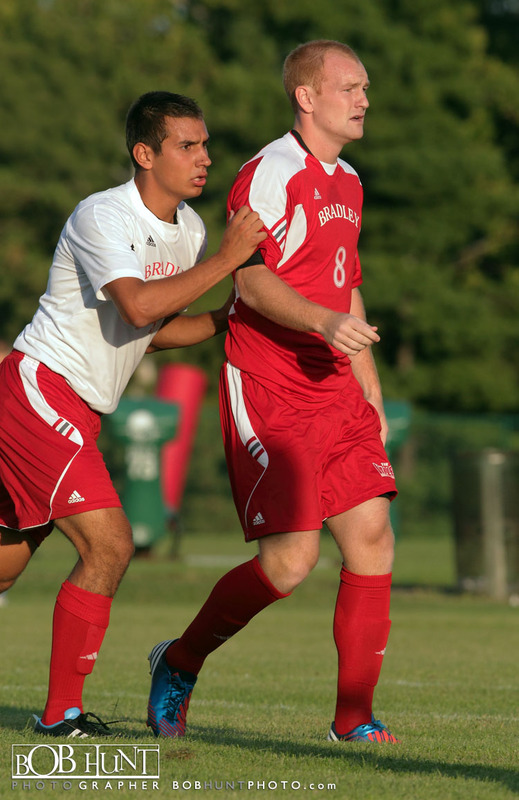 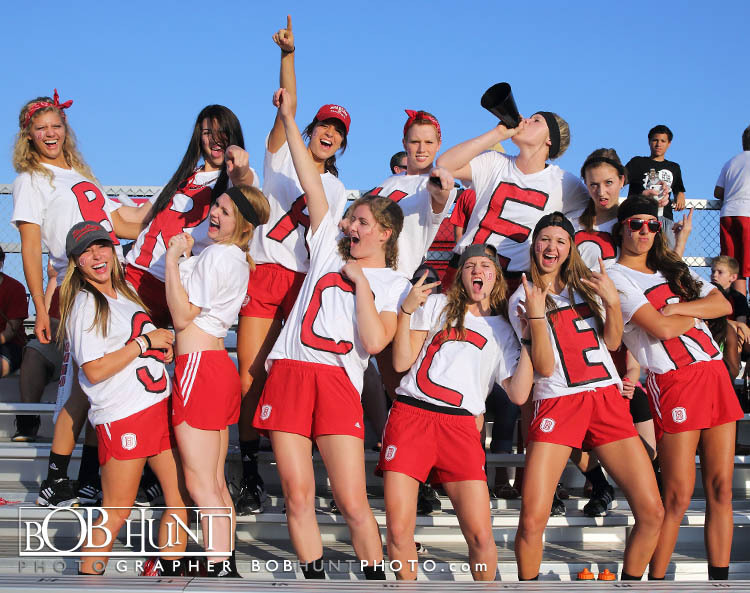 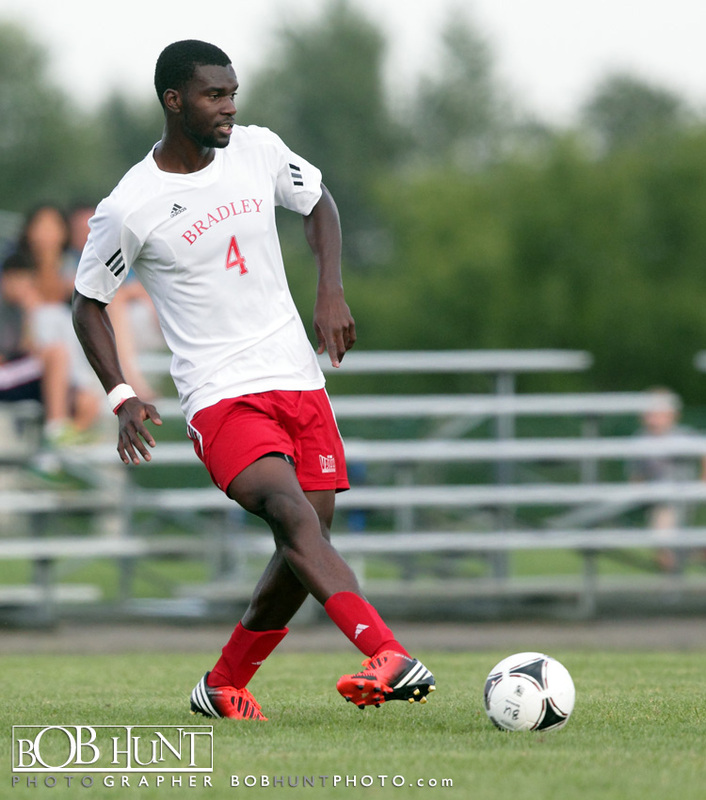 Junior Keegan Balle recorded an assist for both teams as the #25 Bradley University Soccer team opened the preseason with a 1-1 draw in the annual Red-White Scrimmage Saturday night at Peoria Notre Dame High School. 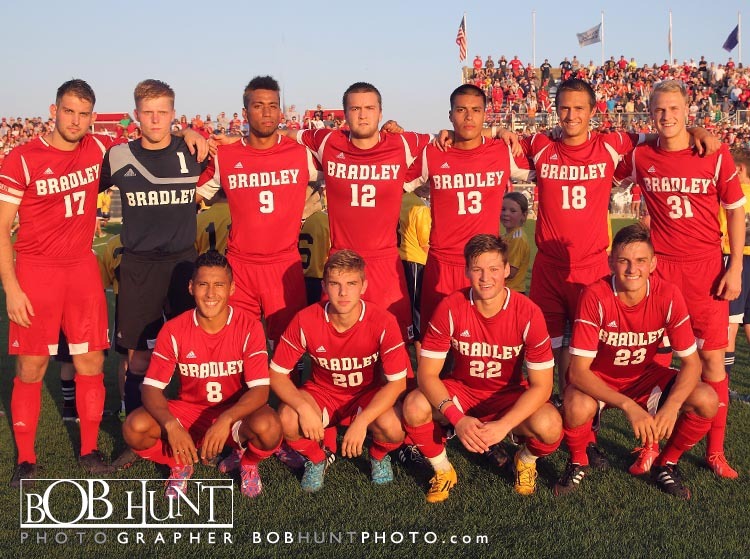 Playing three 25-minute periods with juggling lineups, defense dominated the night on the site of Bradley’s first-ever game as a NCAA Division I program 25 years ago. 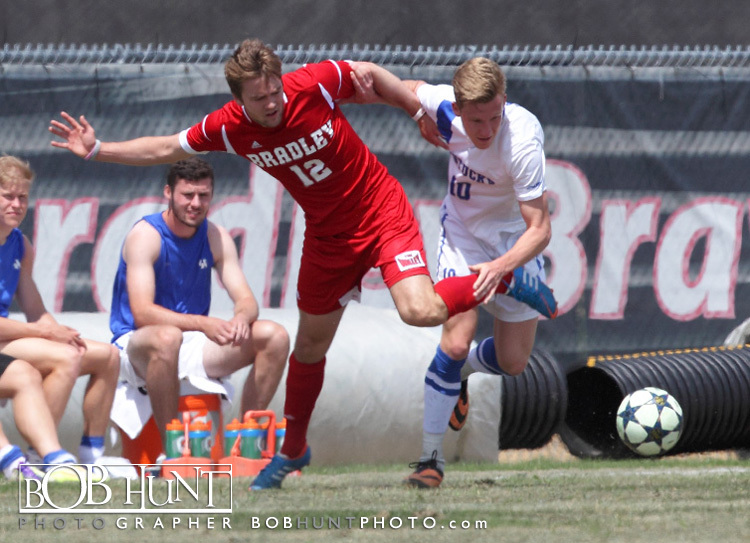 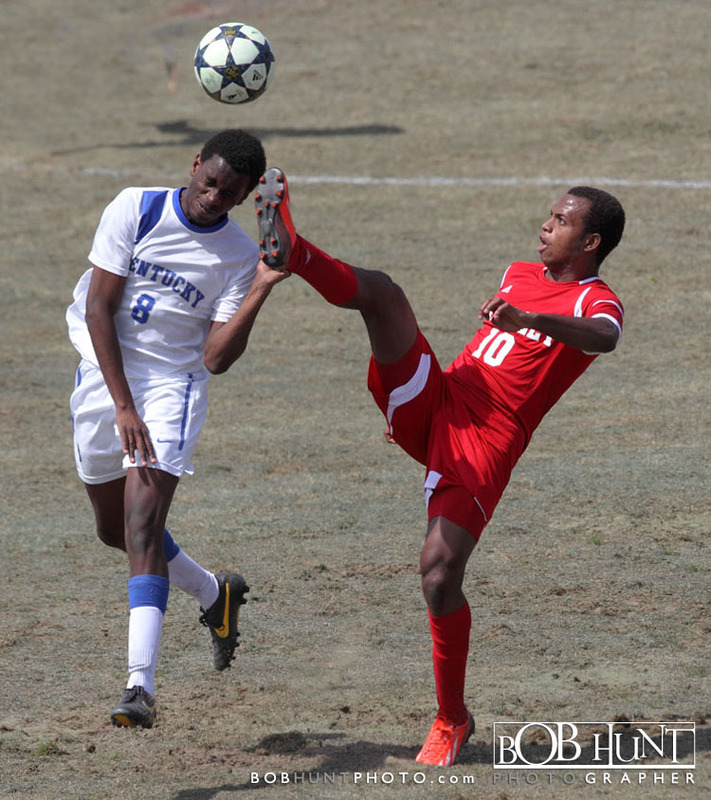 The first 25-minute segment saw the top defensive group go head-to-head against the top attacking unit and the defensive group stood strong as both sides managed just one shot in the first period. 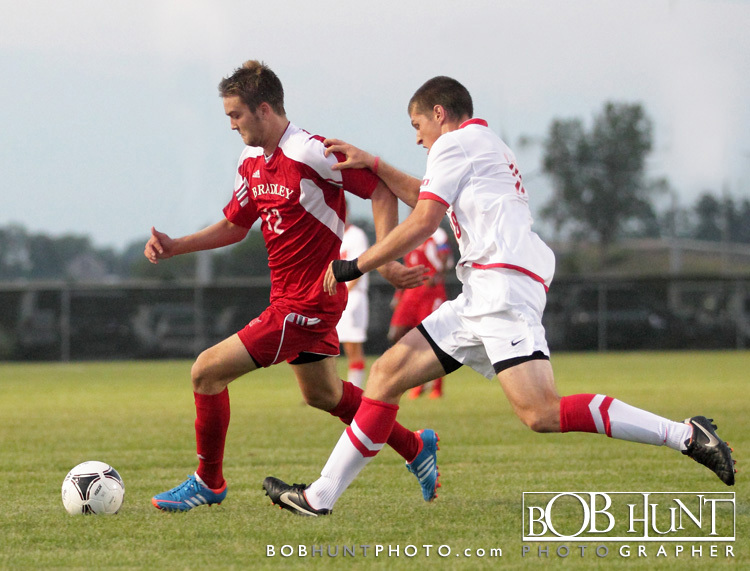 The second period featured a prominently veteran Red squad against a newcomer-dominated White side. 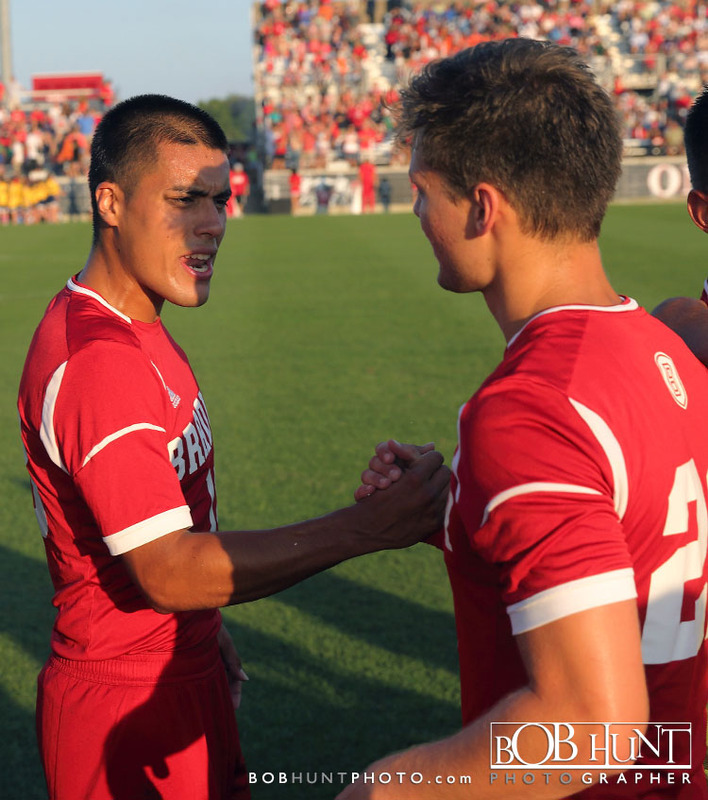 The veterans earned the advantage, though with a little help from a freshman. 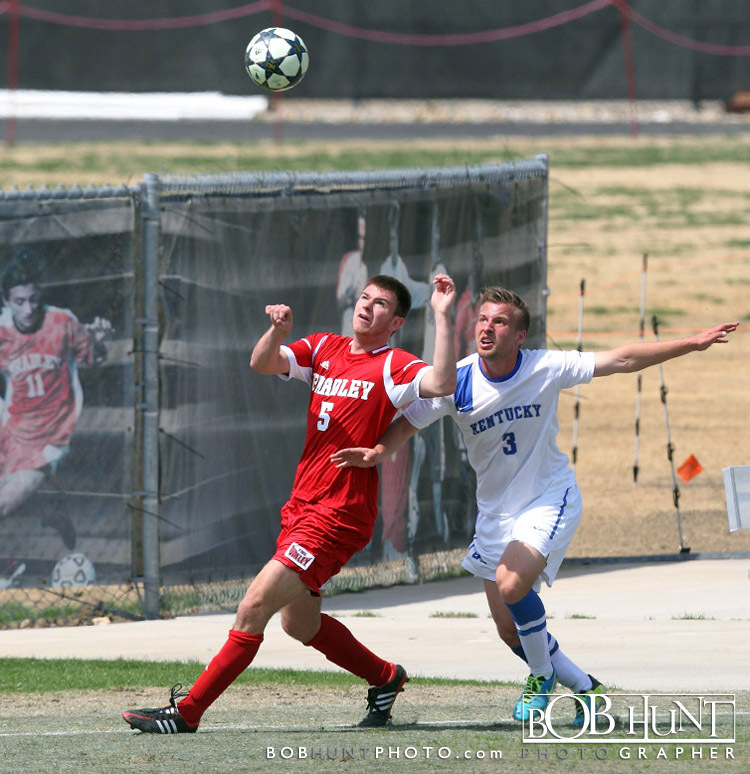 In a sequence that started in the defensive half in the 32nd minute, the Red side built possession up the left flank toward midfield. 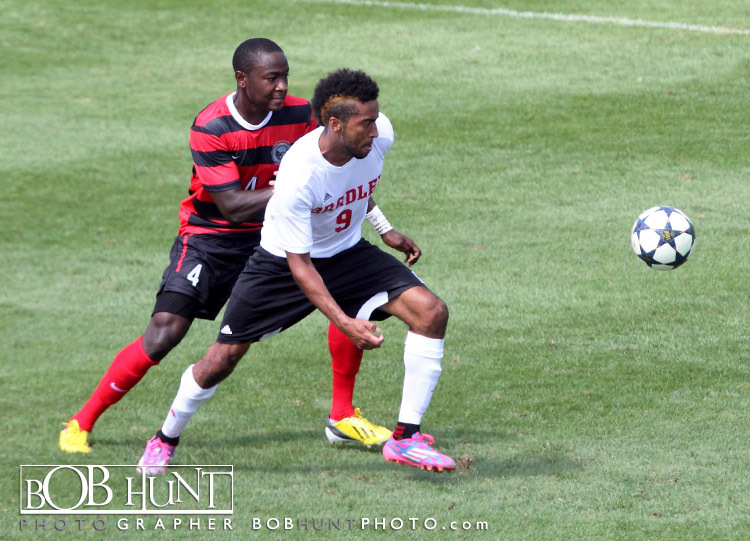 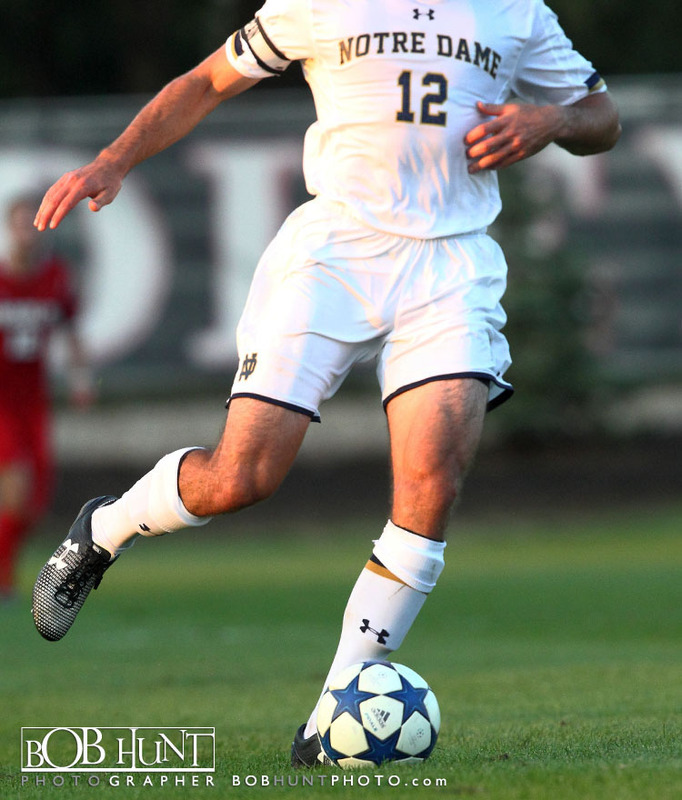 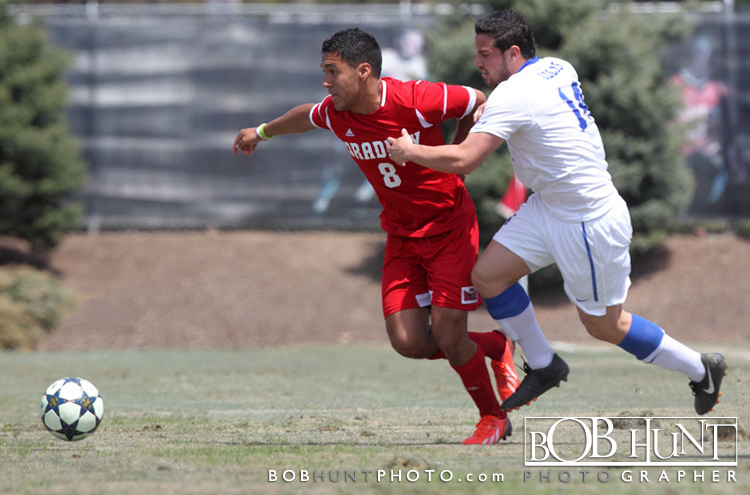 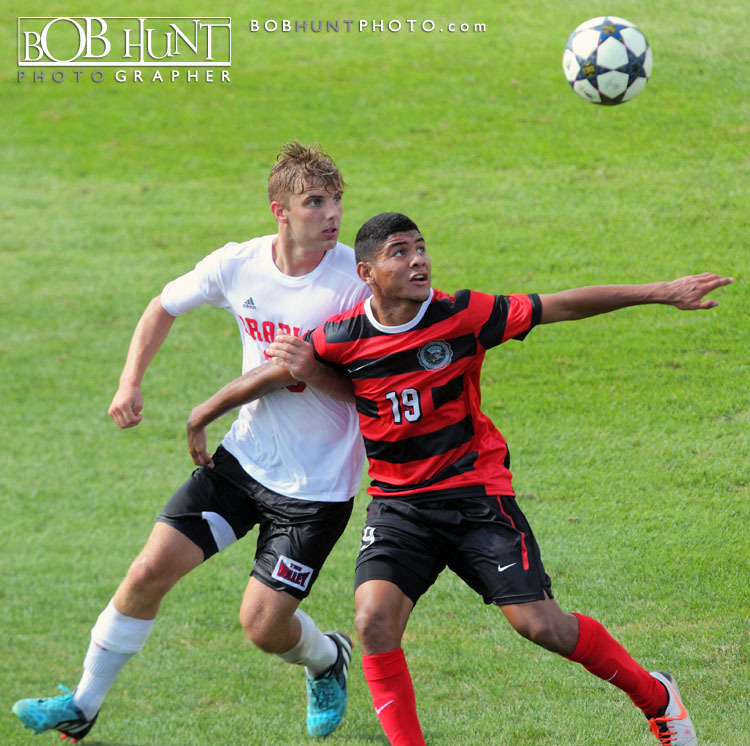 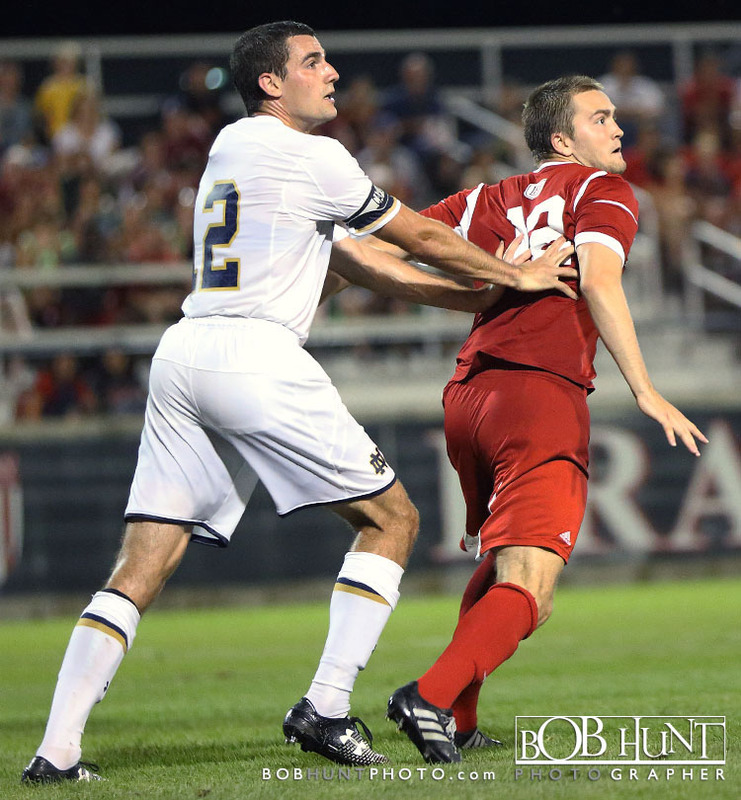 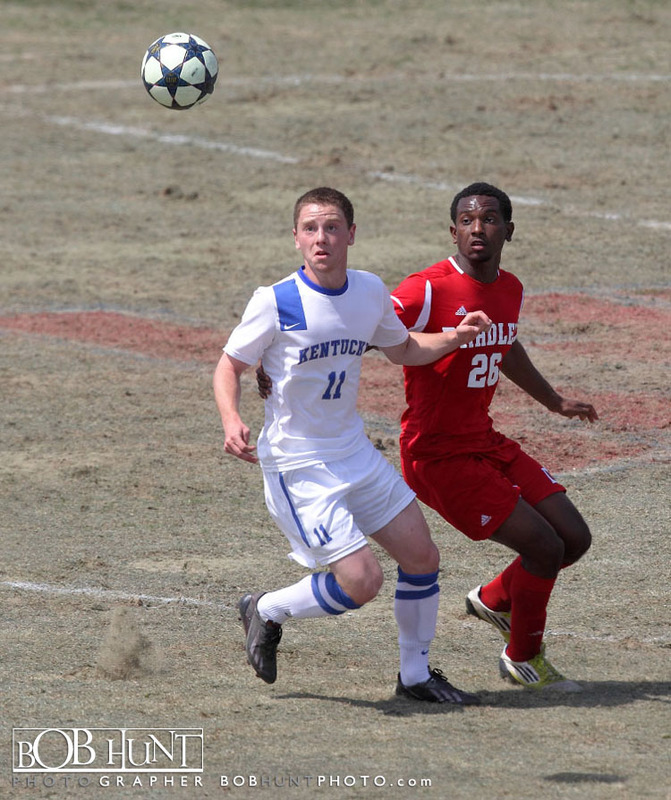 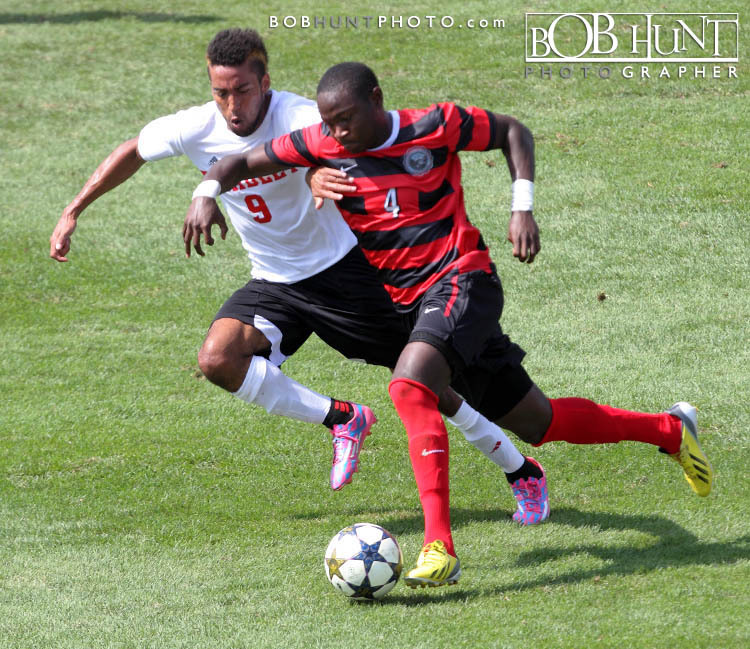 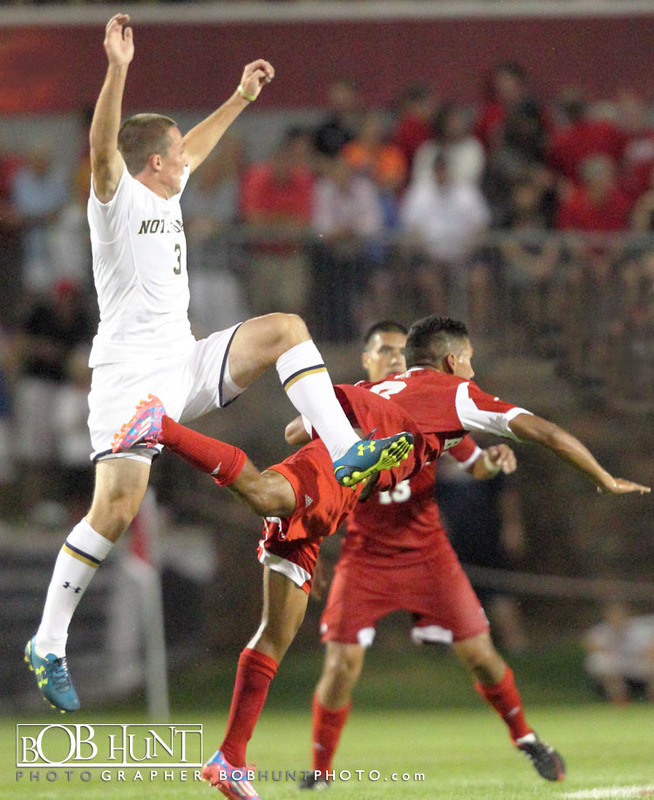 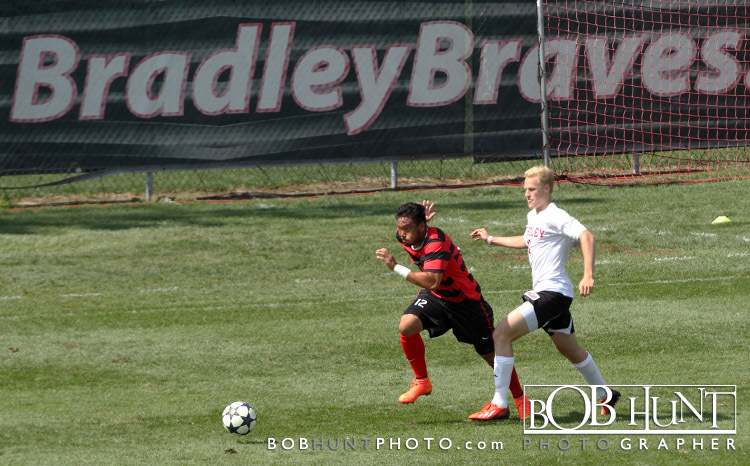 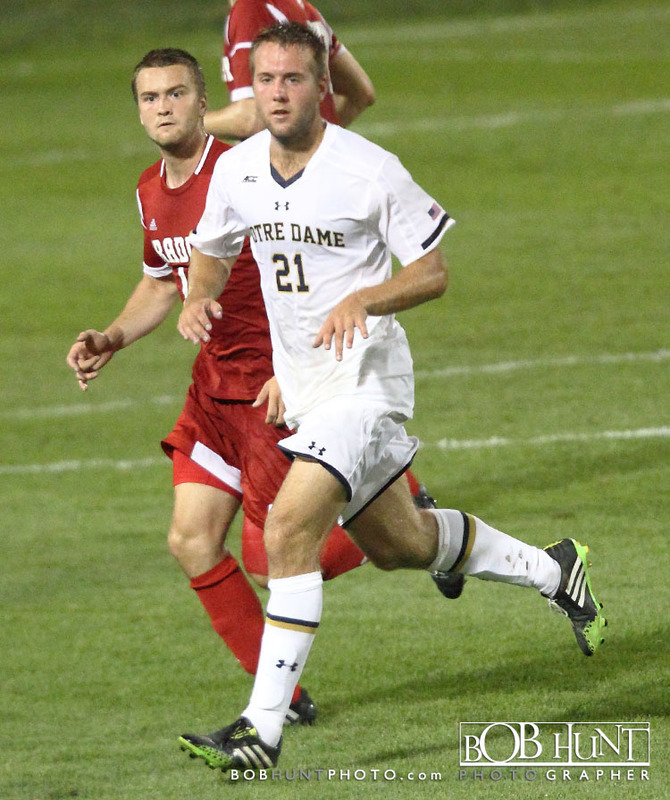 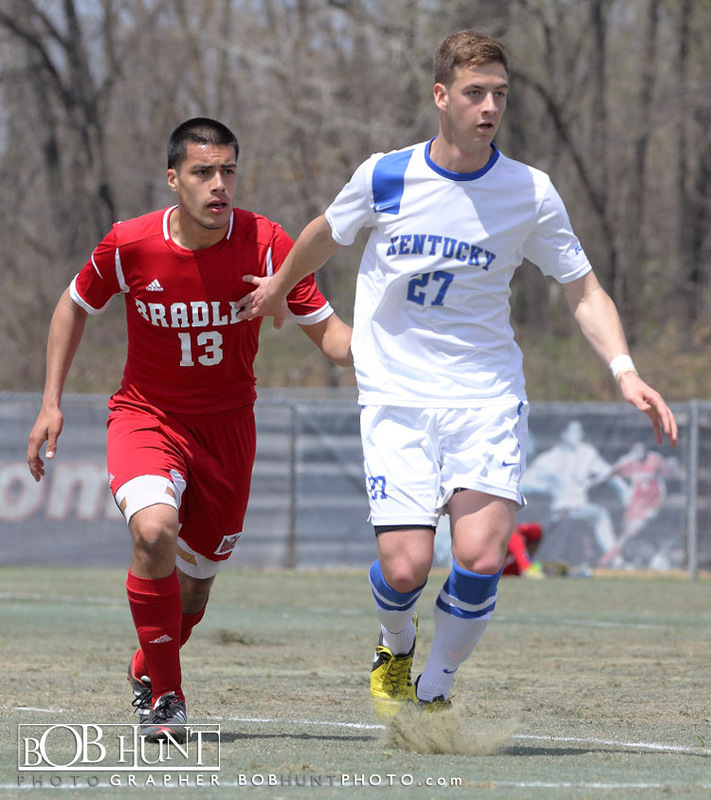 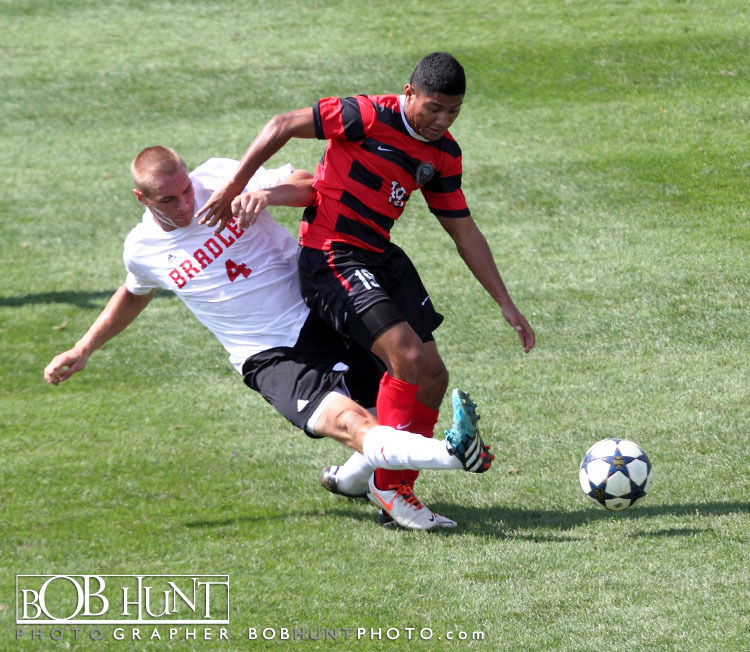 Freshman Joe Morales kept a Ross Williams centering ball moving forward to Balle, who sprang Wojciech Wojcik with a pass through the center of the defense. 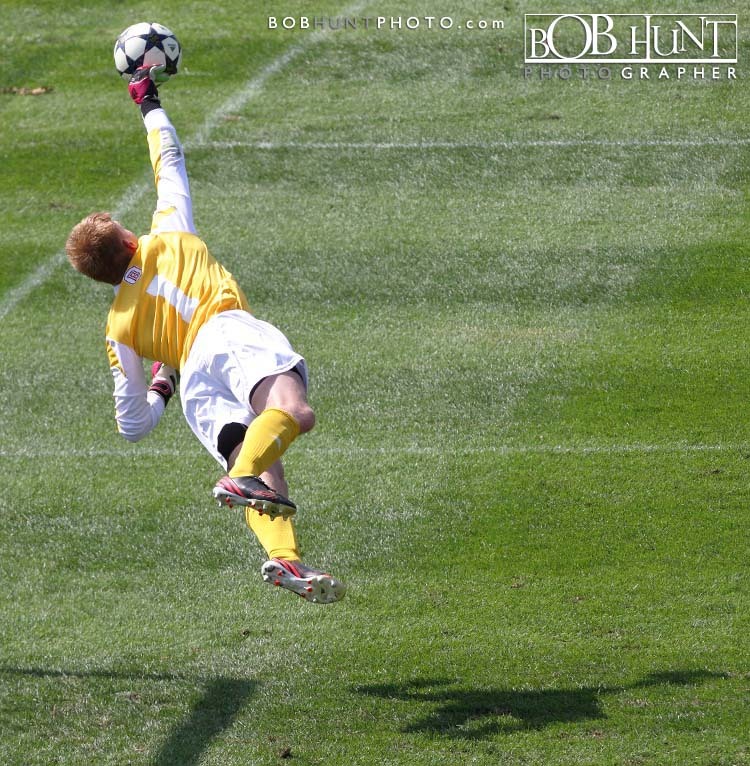 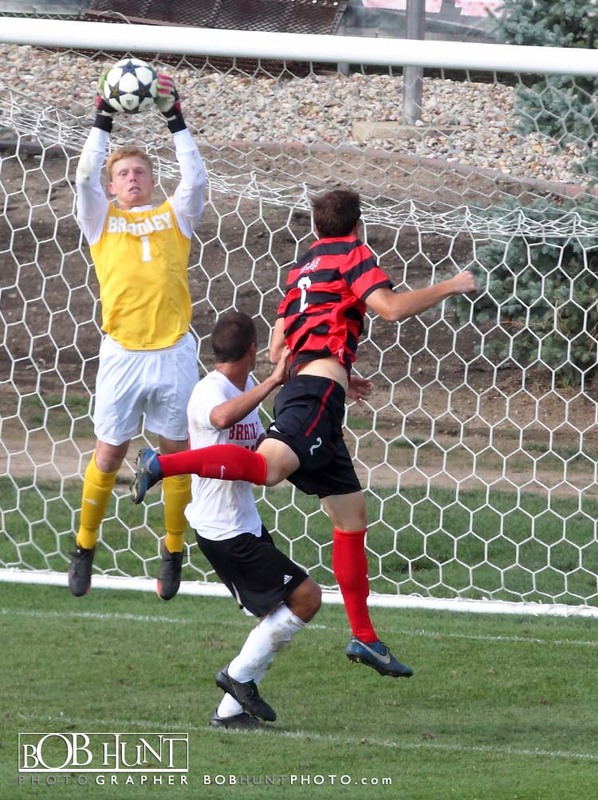 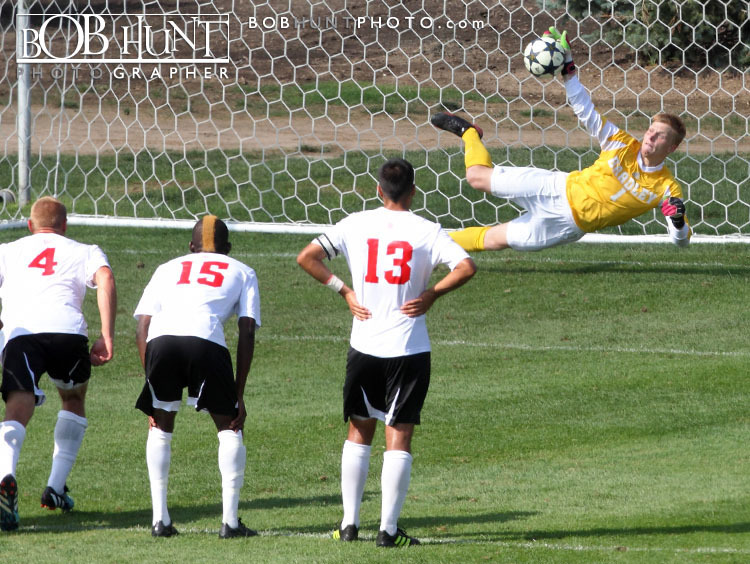 Wojcik beat redshirt freshman keeper Shay Niemeyer to the ball at the top of the 18 and chipped the sliding White team keeper with a shot that rolled just inside the right post for a 1-0 Red team lead at 31:44. 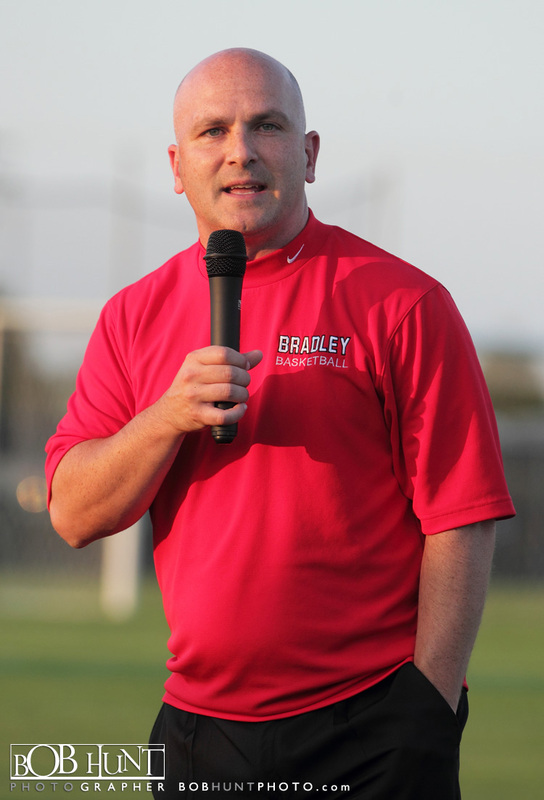 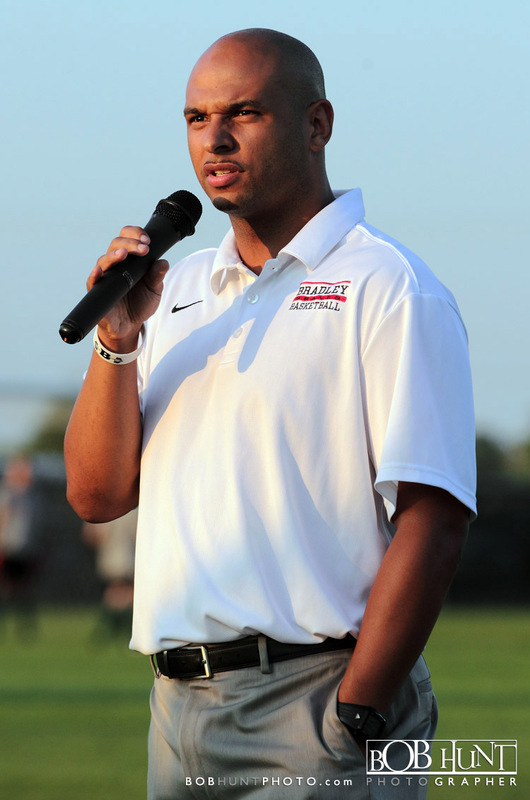 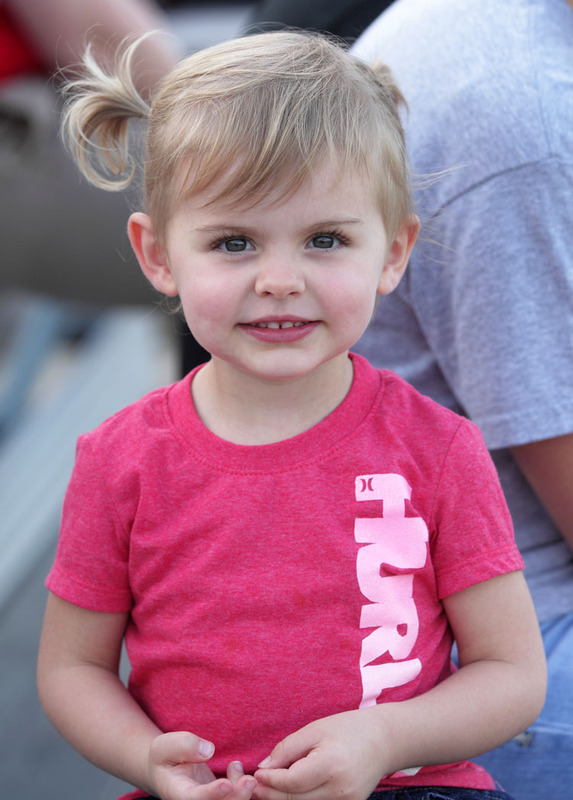 The 2012 Braves will face outside competition for the first time Tuesday when they host Dayton in a 7:30 p.m. exhibition game at Morton’s McClallen Park. 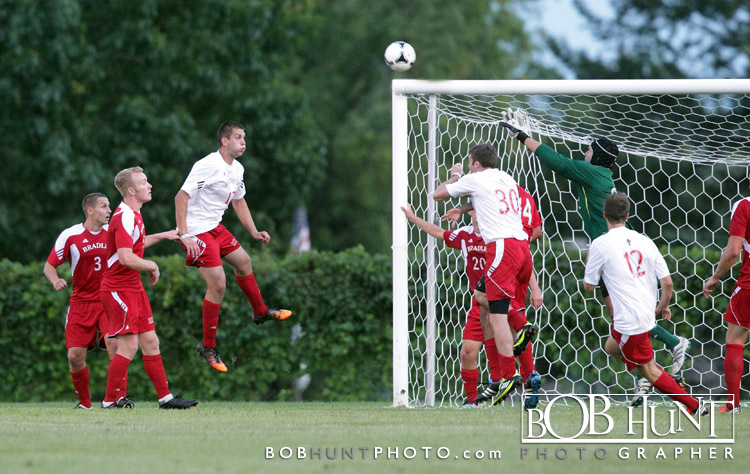 Click here to view more images and purchase photo’s. 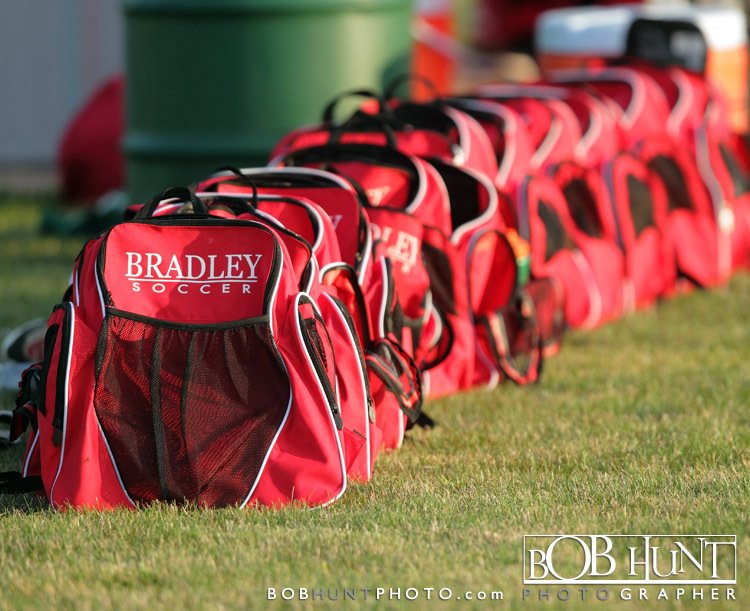 Saturday, Aug. 11 | Peoria, Ill. | Peoria Notre Dame H.S. 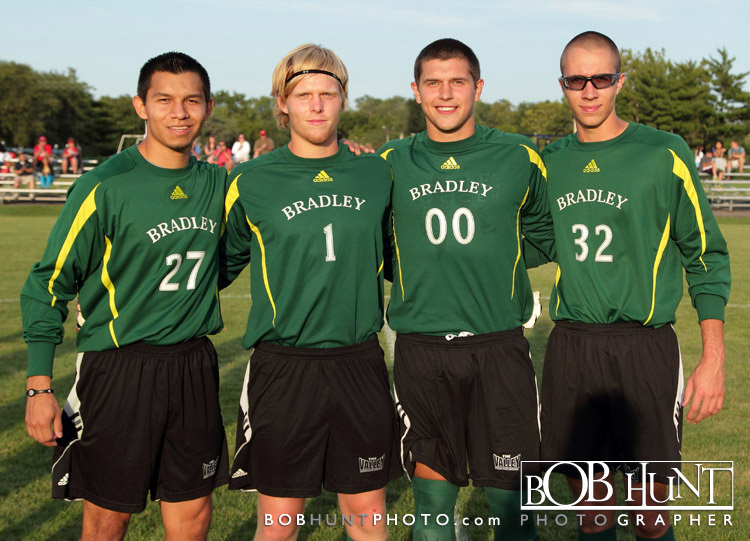 White: Shay Niemeyer (25 minutes, 1 save, 1 GA); Raciel Ocampo (25 minutes, 1 save, 0 GA); Logan Ketterer (25 minutes, 0 saves, 0 GA).